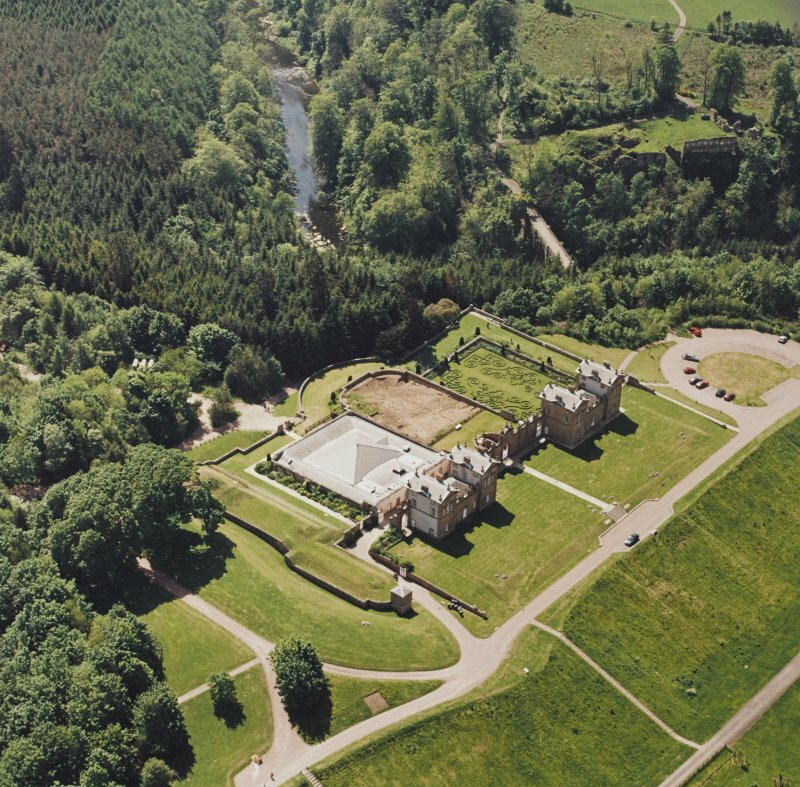 Aerial view of Chatelherault, Cadzow Castle and the Duke's Bridge, taken from the ENE. 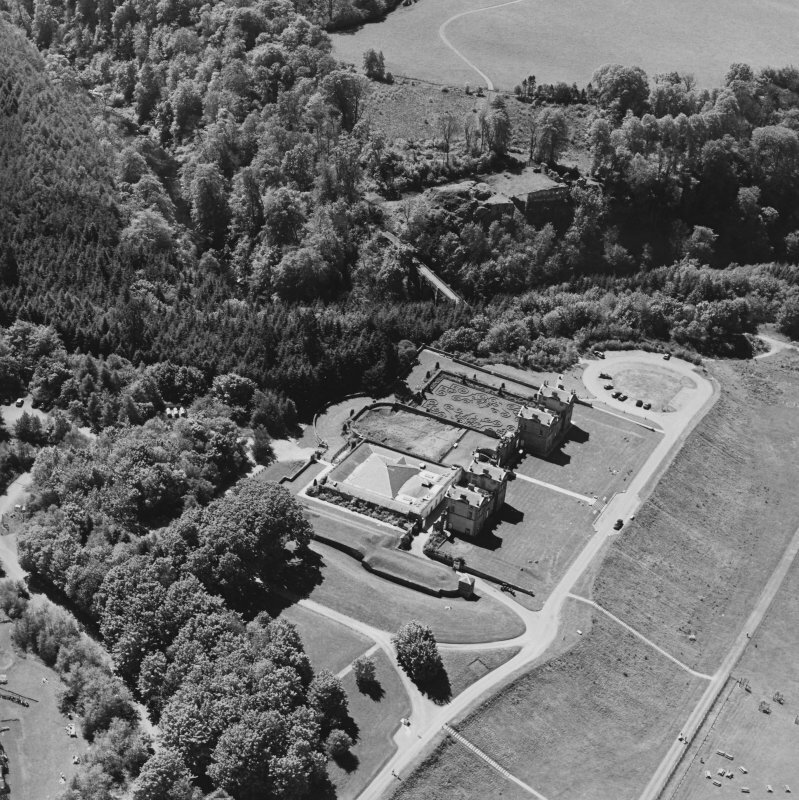 Aerial view of Chatelherault and Cadzow Castle, taken from the NNE. 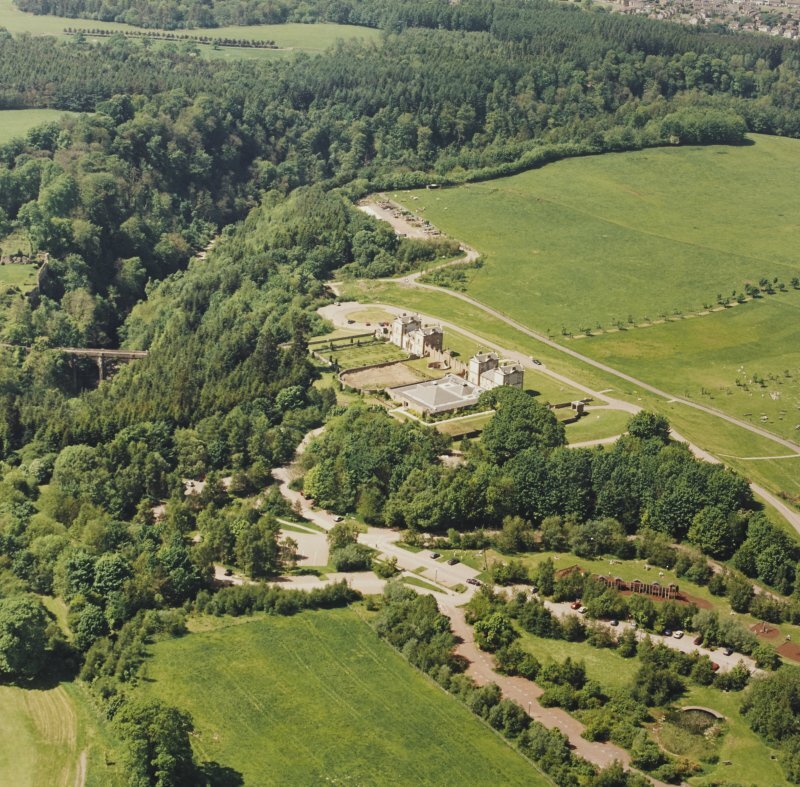 Aerial view of Chatelherault, Cadzow Castle and the Duke's Bridge, taken from the NNE. 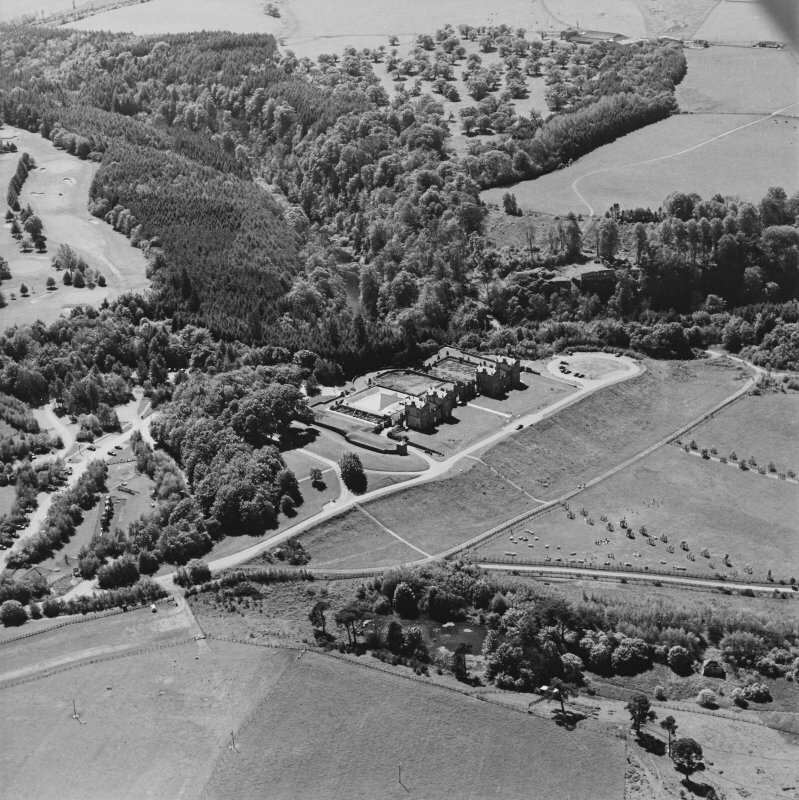 Aerial view of Chatelherault, taken from the NNE. 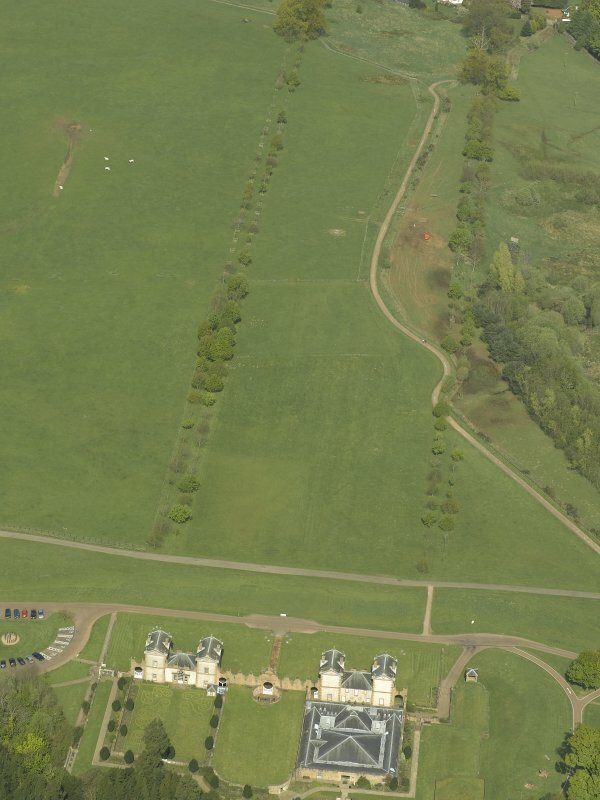 General aerial view of Chatelherault, taken from the S.
Oblique aerial view of Chatelherault Hunting Lodge, taken from the SW.
Oblique aerial view of Cadzow Castle, Chatelherault and the Duke's Bridge, taken from the E.
Photograph of survey drawing showing Principal Facade and Plan Insc. 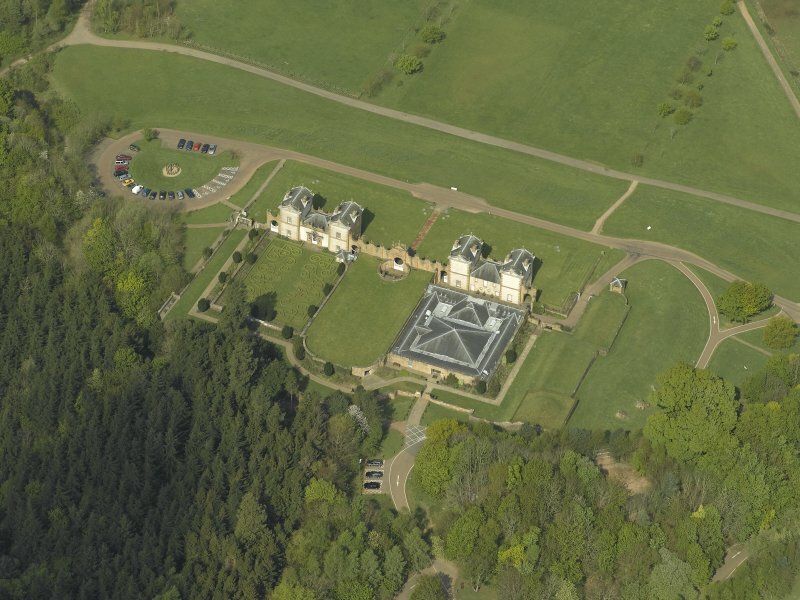 "GDH, AL"
Aerial view of Chatelherault, taken from the SSE. 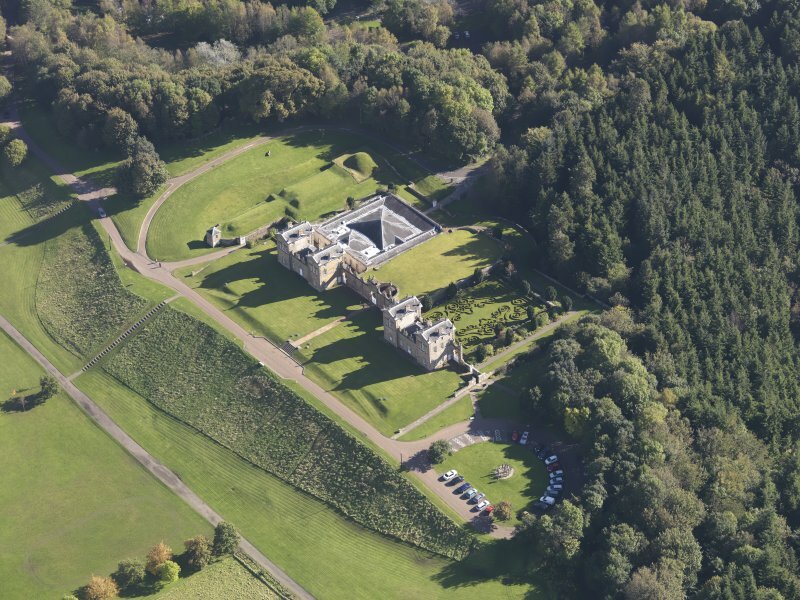 General aerial view of Chatelherault and Cadzow Castle, taken from the SSW. 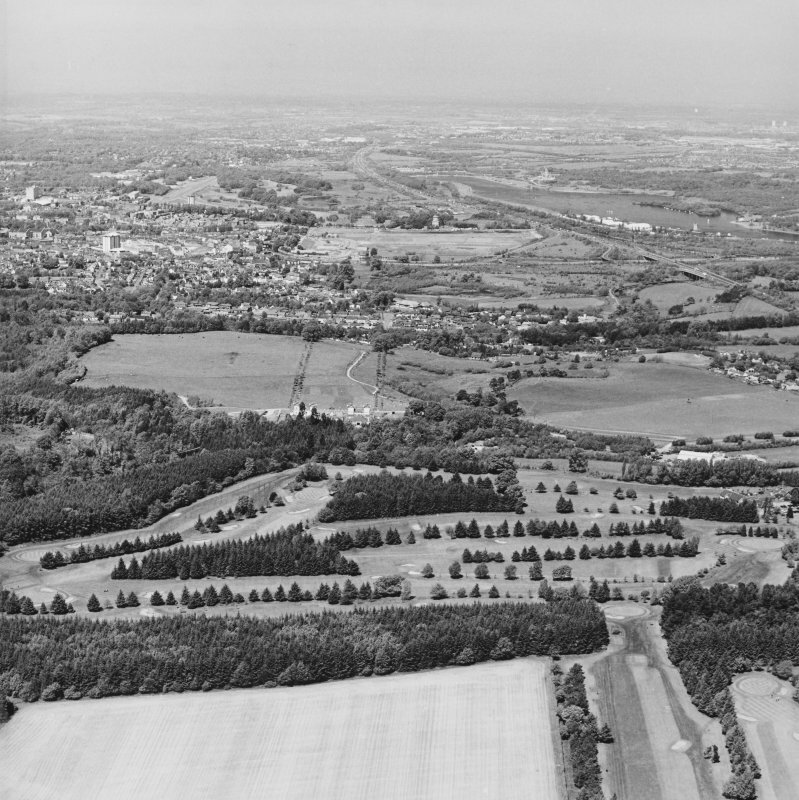 Aerial view of Chatelherault, taken from the NNW. 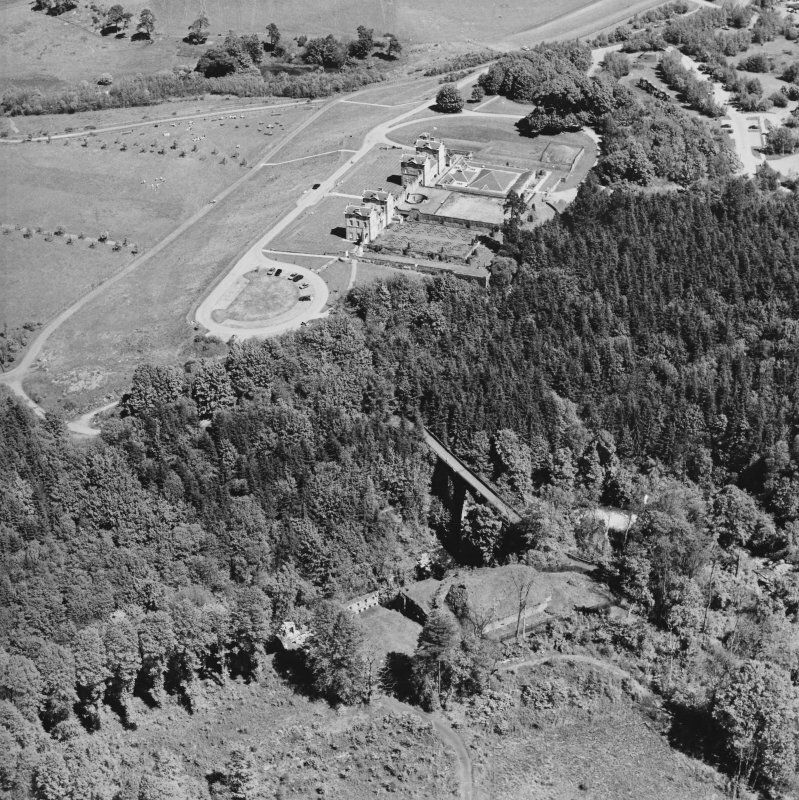 General aerial view of Chatelherault and Hamilton Mausoleum, taken from the SSE. 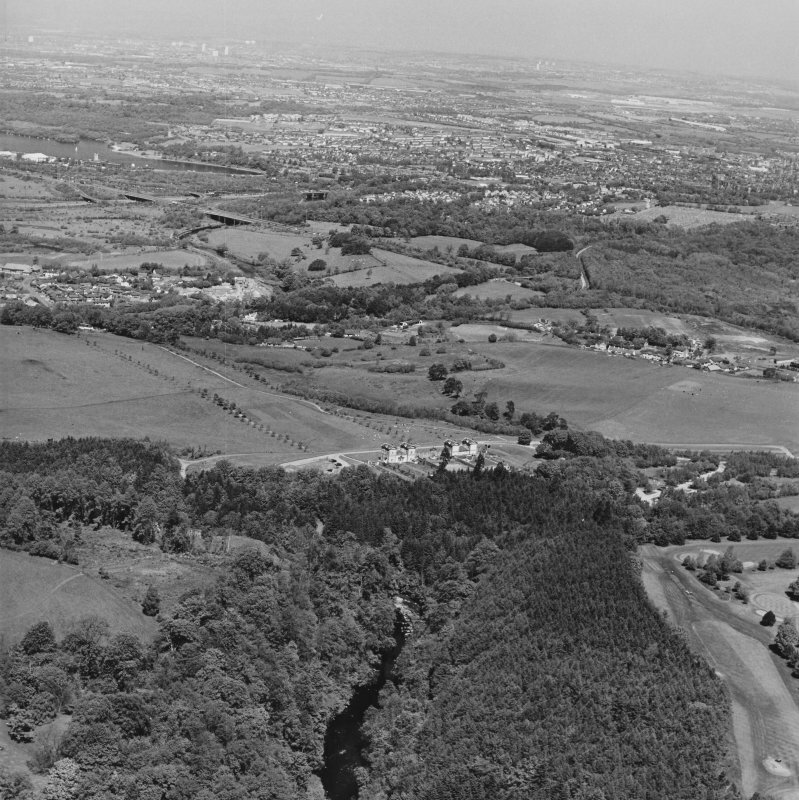 Aerial view of Chatelherault and the Duke's Bridge, taken from the SW.
Aerial view of Chatelherault and the Duke's Bridge, taken from the SE. 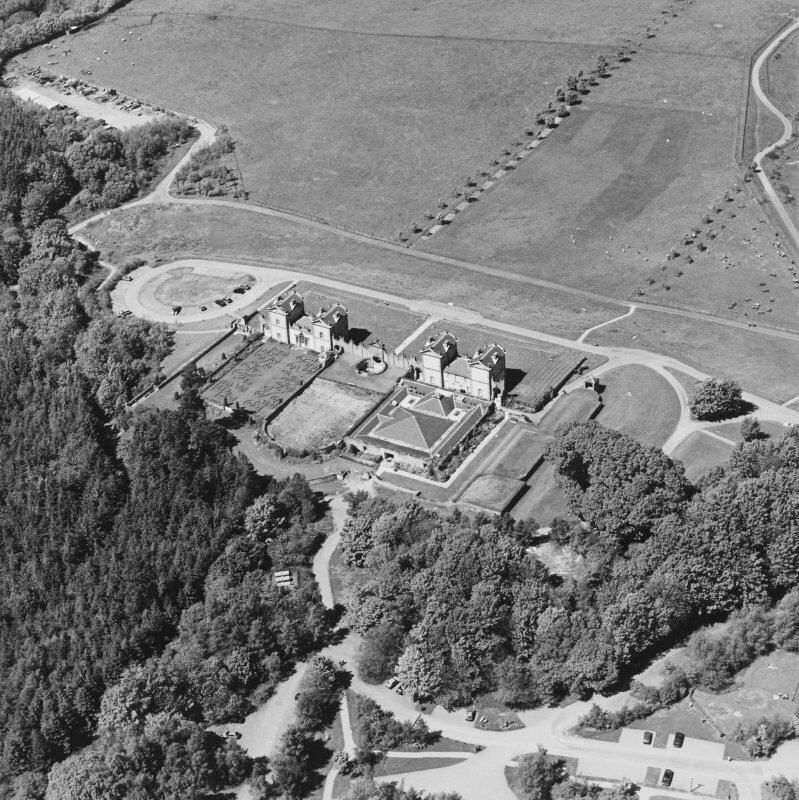 Oblique aerial view of Chatelherault Hunting Lodge, taken from the ENE. 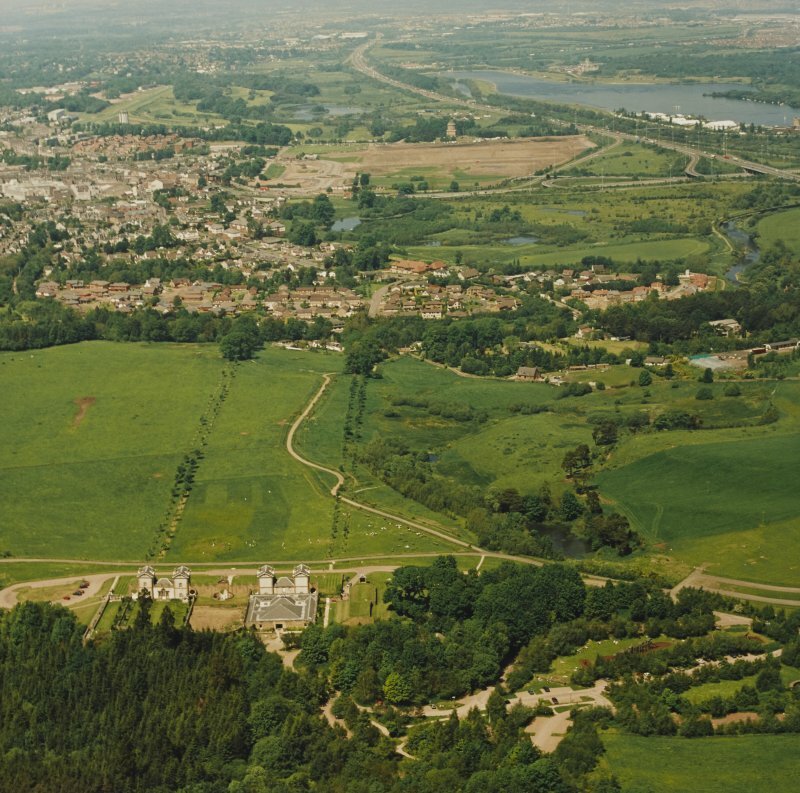 Oblique aerial view centred on Chatelherault, taken from the SW.
Oblique aerial view centred on the hunting lodge and ornamental gardens with the remains of a castle adjacent, taken from the SW.
Aerial view of Chatelherault, Cadzow Castle and the Duke's Bridge, taken from the NW. 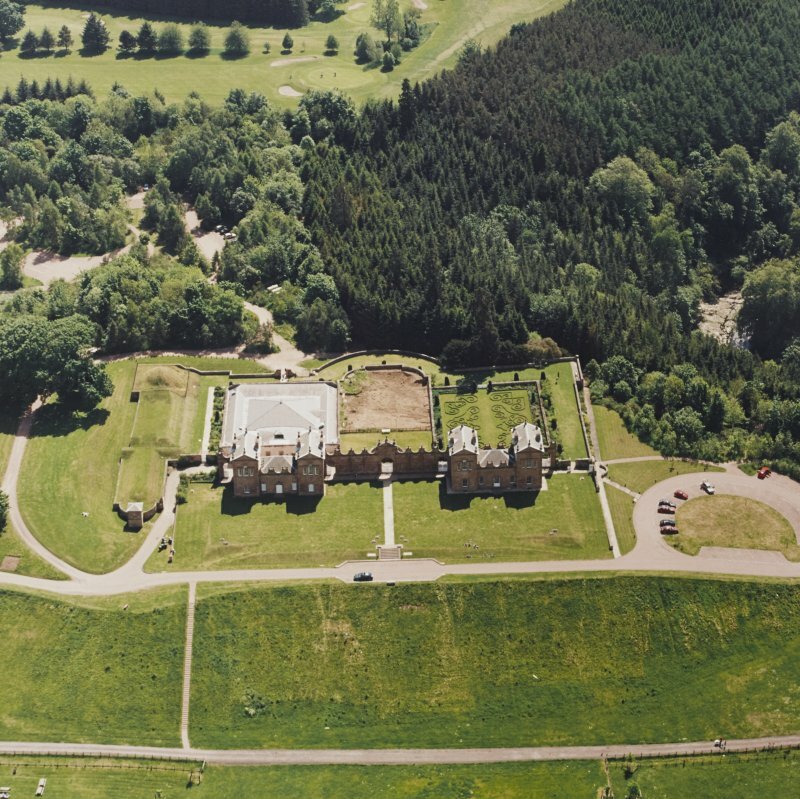 Aerial view of Chatelherault, taken from the S.
Oblique aerial view of Chatelherault Hunting Lodge, taken from the WNW. 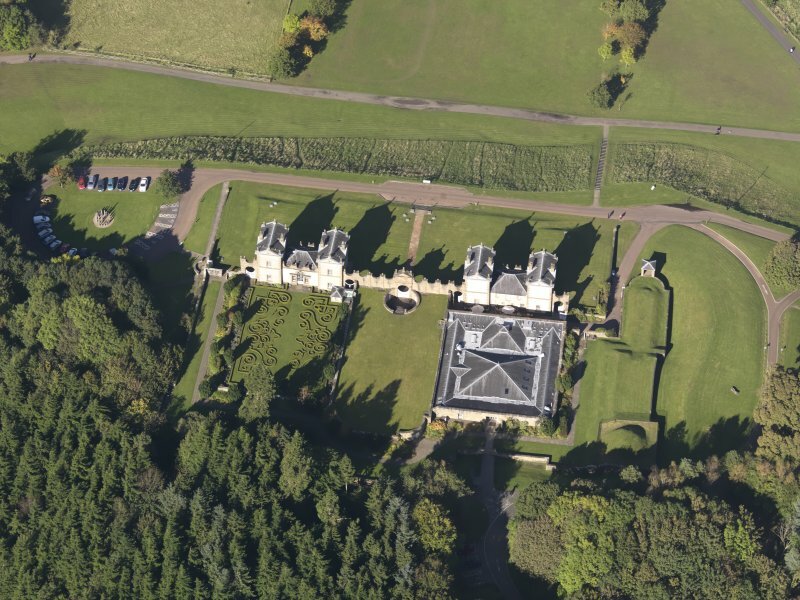 General aerial view of Chatelherault and Hamilton Mausoleum, taken from the SSE. 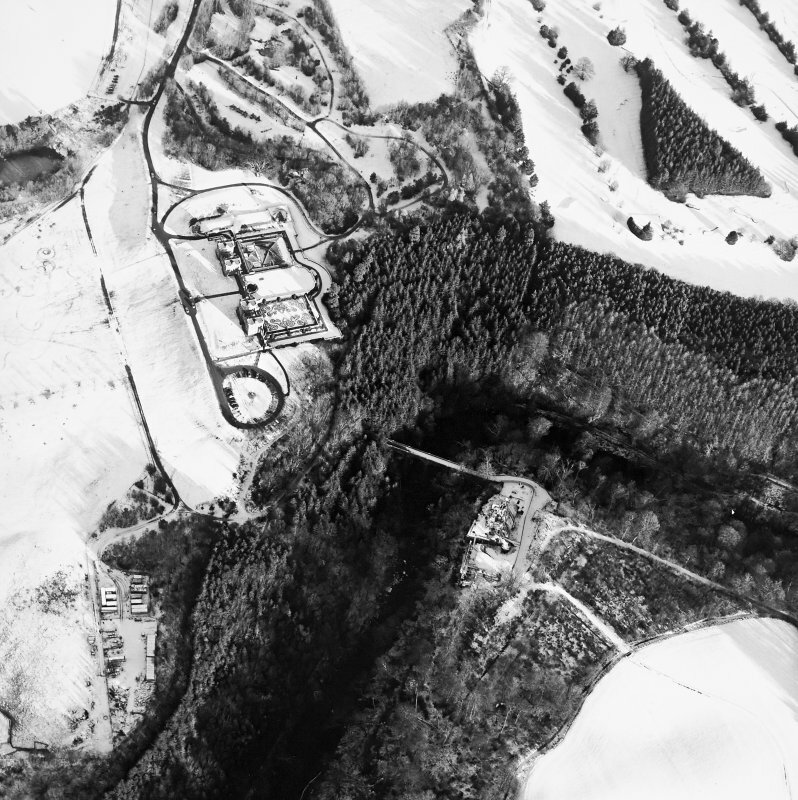 Digital image of C 76872/CN. 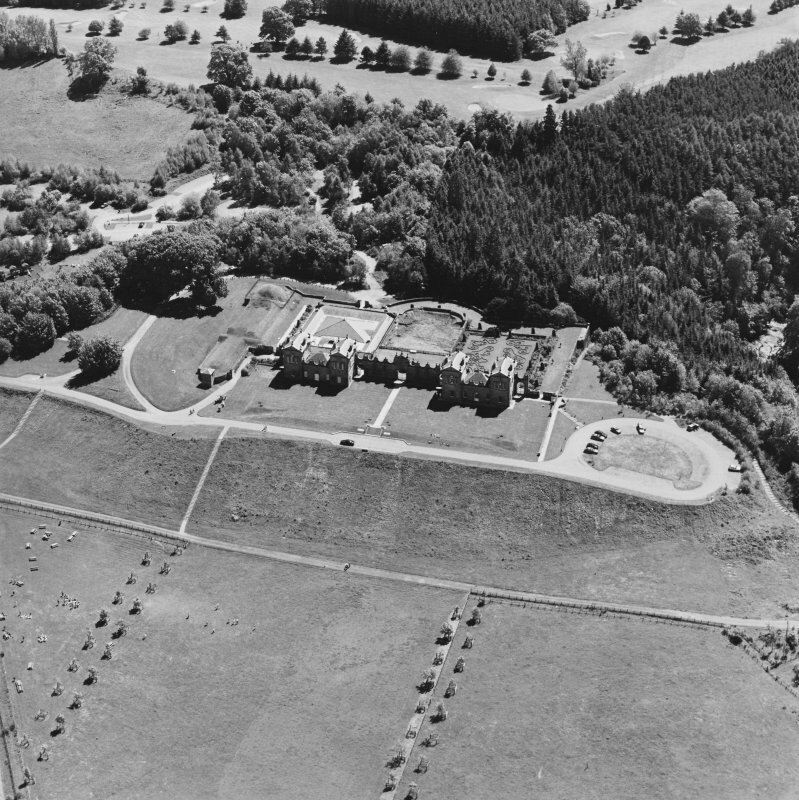 Oblique aerial view centred on the hunting lodge and ornamental gardens with the remains of a castle adjacent, taken from the SE. 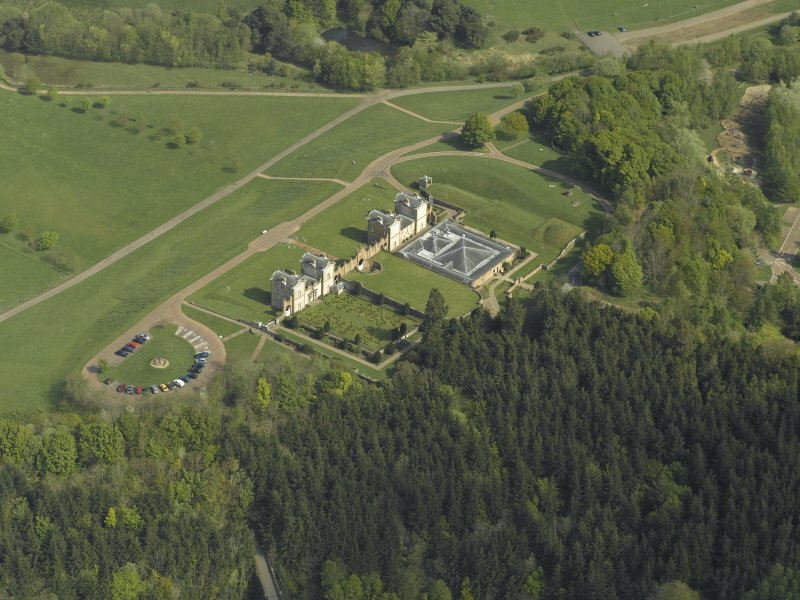 Oblique aerial view centred on the hunting lodge and ornamental gardens with the remains of a castle adjacent, taken from the WSW. 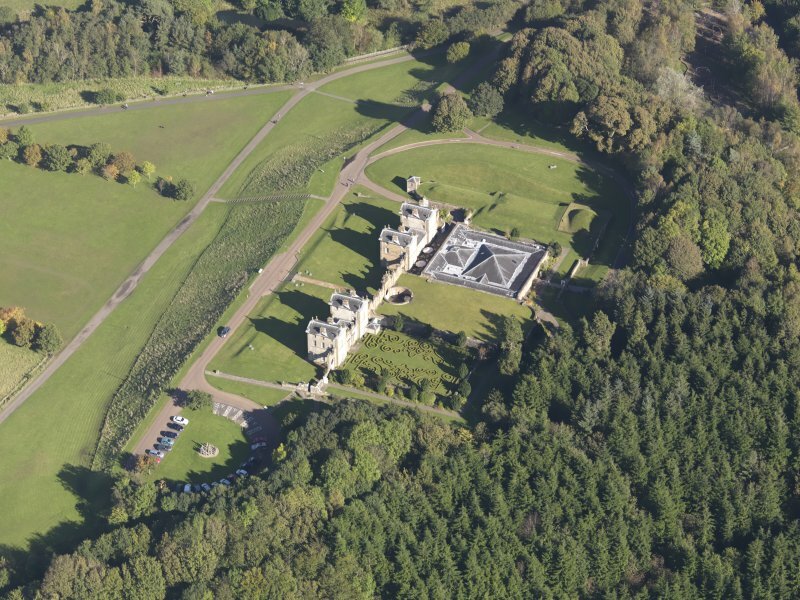 Oblique aerial view centred on the hunting lodge and ornamental gardens with the remains of a castle adjacent, taken from the NW. 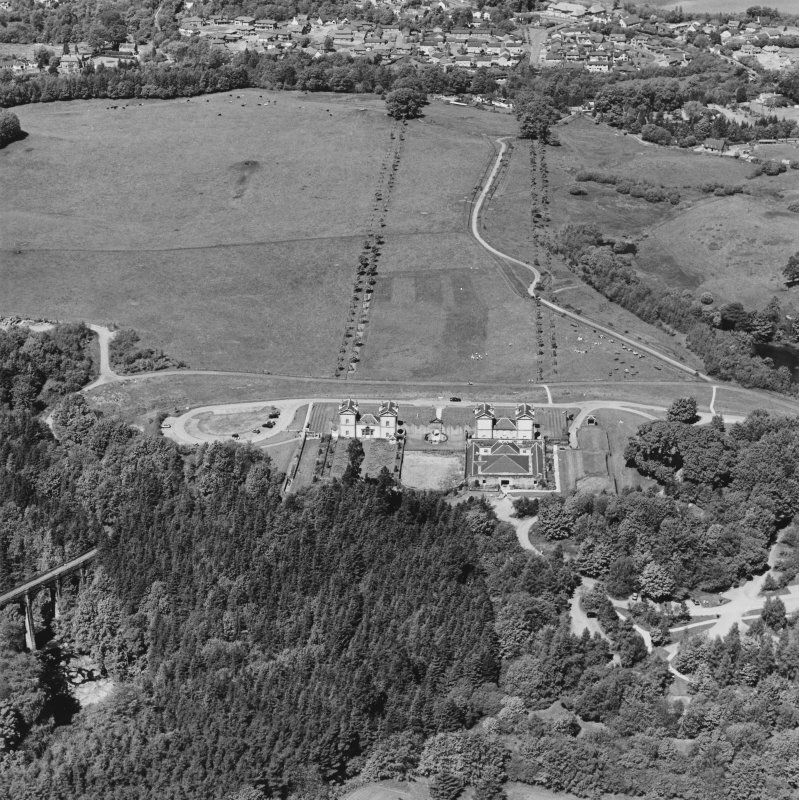 General aerial view of Chatelherault, the Duke's Bridge and Hamilton Mausoleum, taken from the SSE. 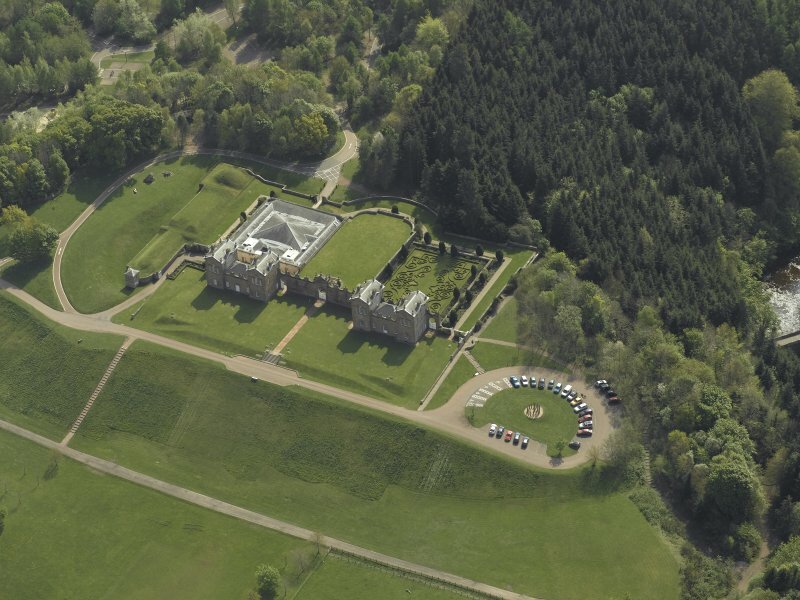 Aerial view of Chatelherault, taken from the SW.
Aerial view of Chatelherault and Cadzow Castle, taken from the NE. 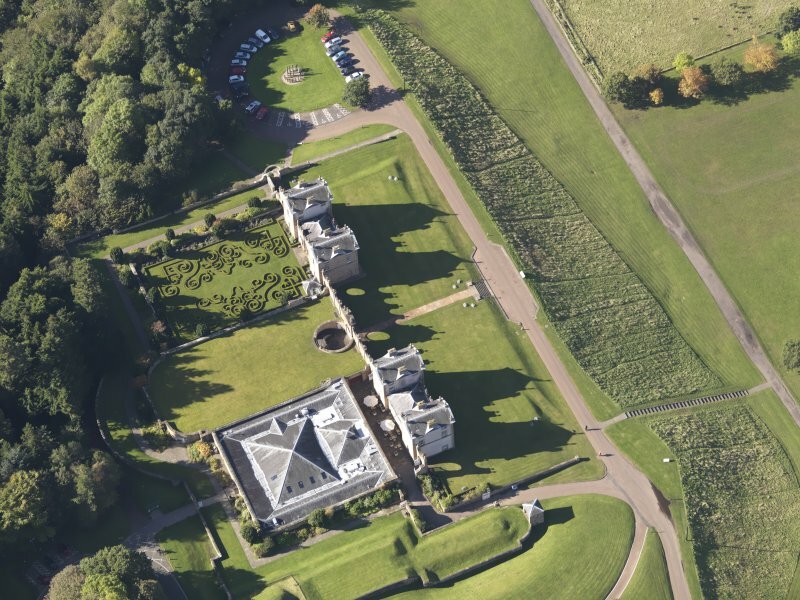 Oblique aerial view centred on the hunting lodge and ornamental gardens with the remains of a castle adjacent, taken from the WNW. 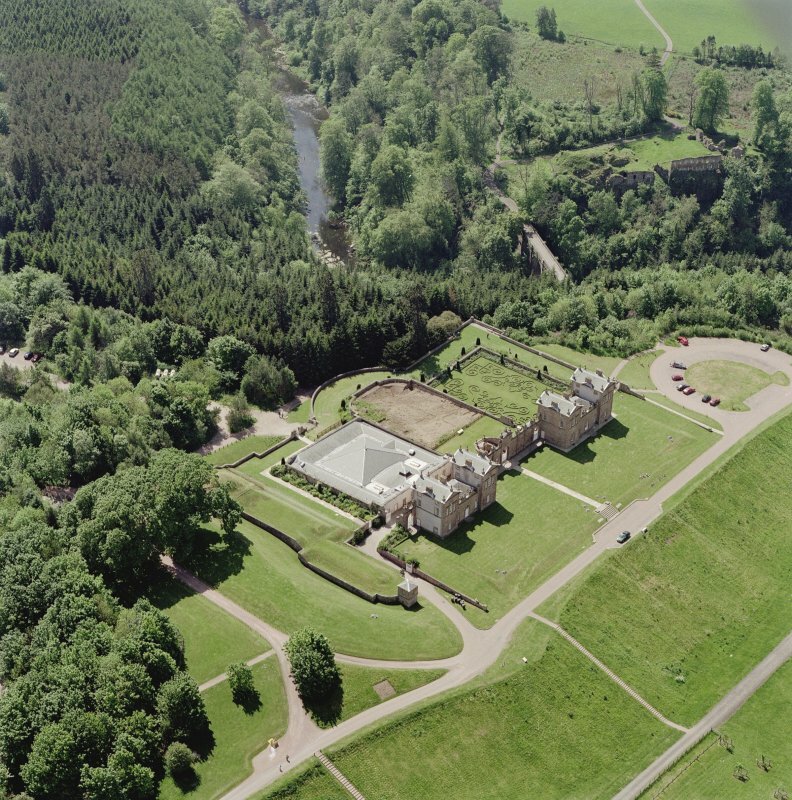 General aerial view of Chatelherault, Cadzow Castle and the Duke's Bridge, taken from the W.
Page 11/1. 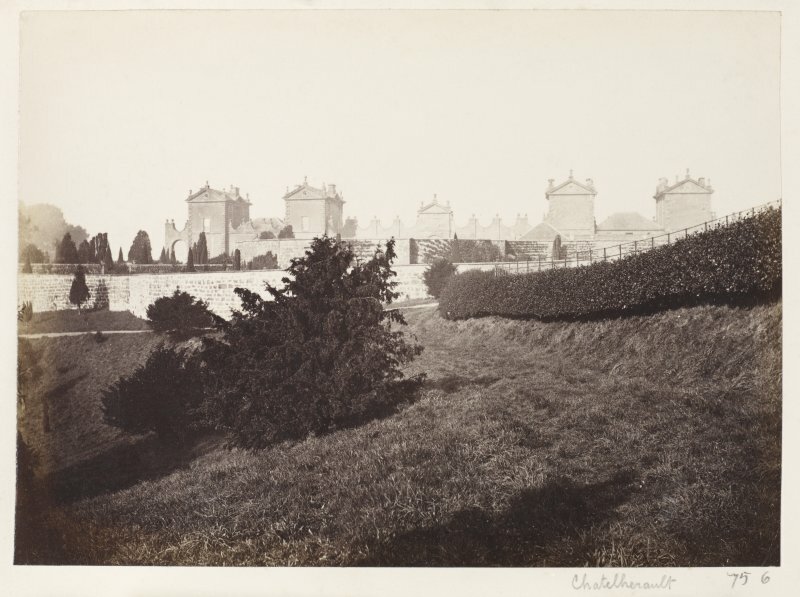 View of Chatelherault from South. 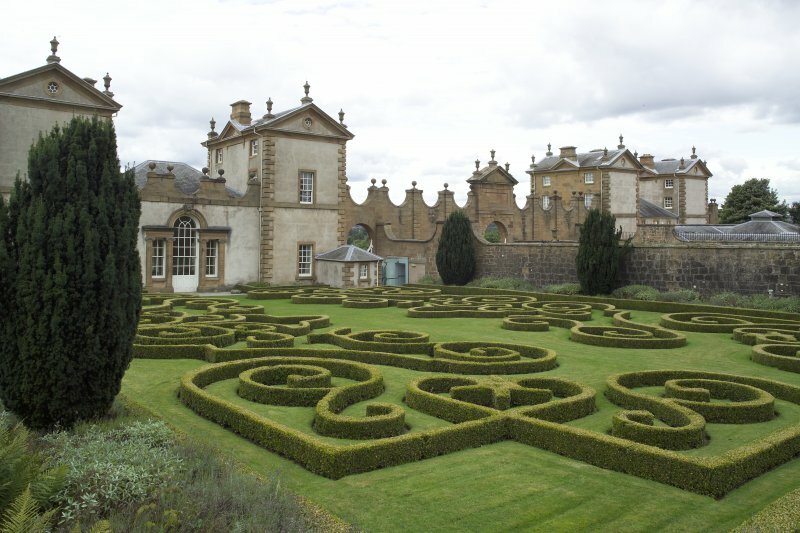 Titled 'Chatelherault.' PHOTOGRAPH ALBUM 146: THE ANNAN ALBUM. 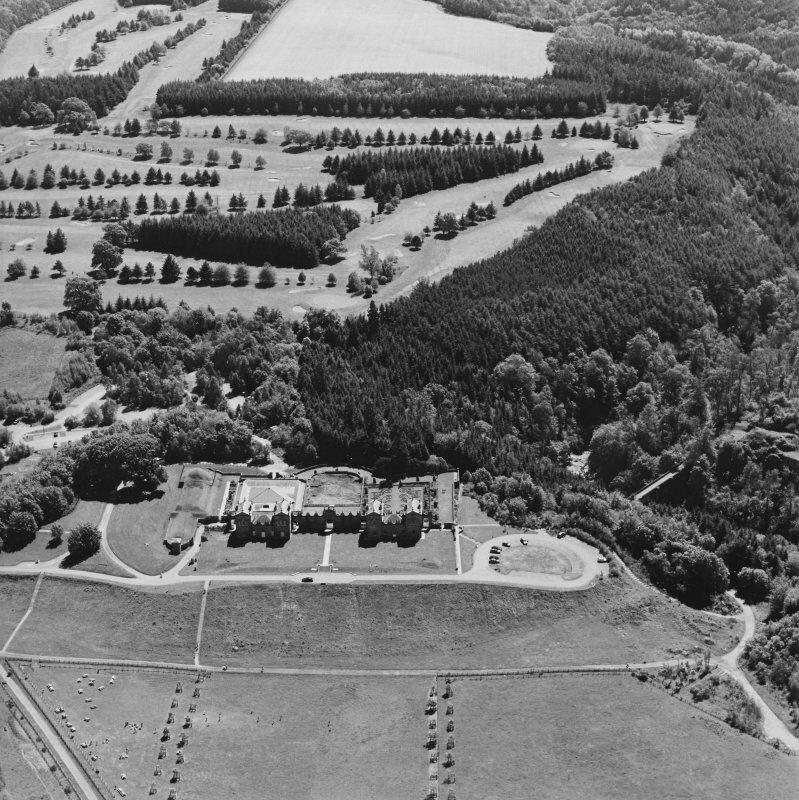 Oblique aerial view looking along the avenue of trees with Chatelherault in the foreground, taken from the SE. 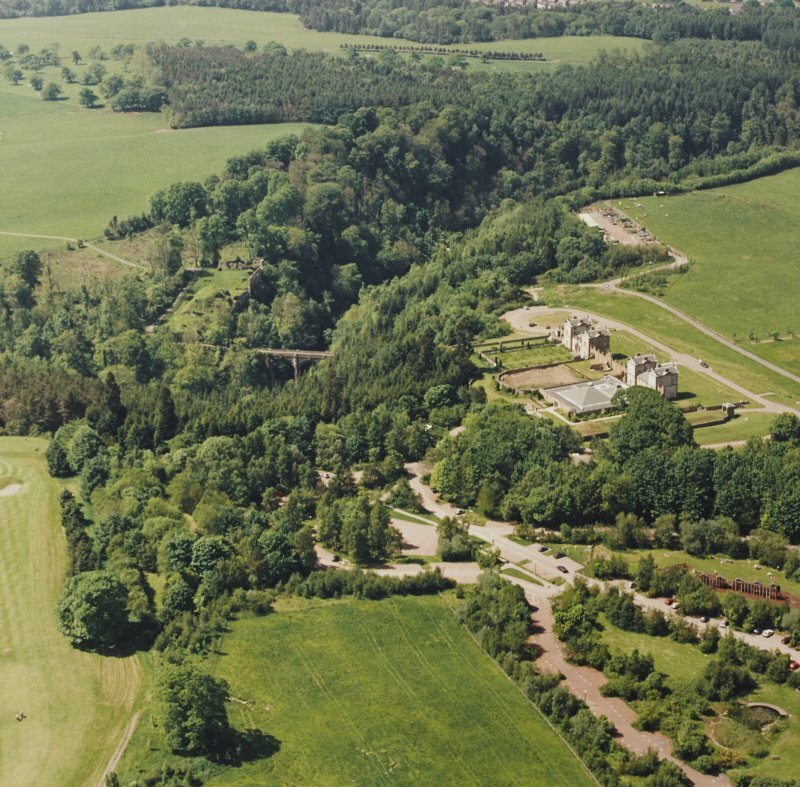 Aerial view of Chatelherault, Cadzow Castle and the Duke's Bridge, taken from the NE. 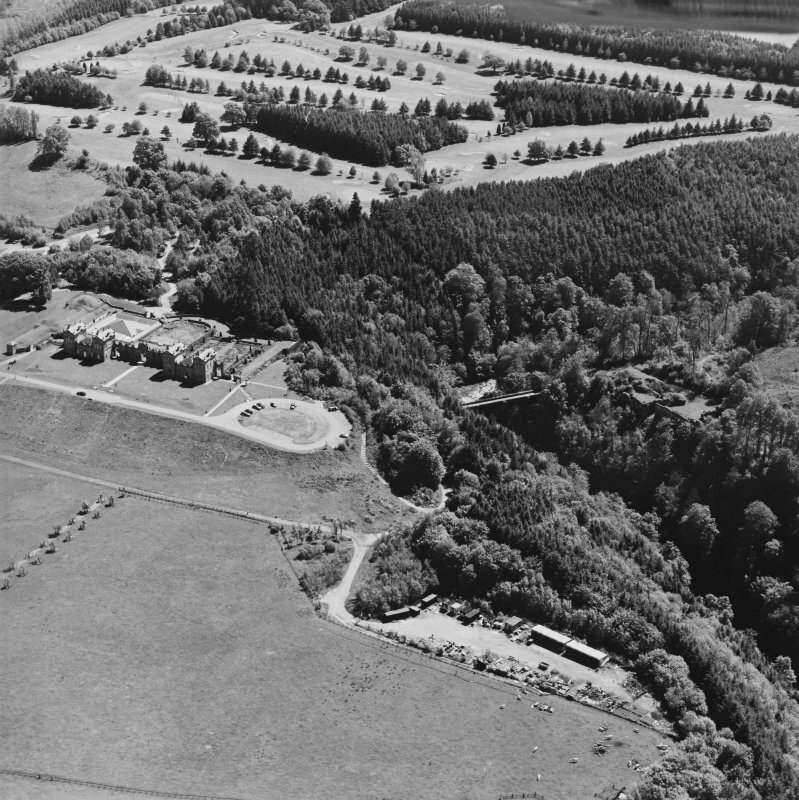 Aerial view of Chatelherault, Cadzow Castle and the Duke's Bridge, taken from the SW.
Aerial view of Cadzow Castle, Chatelherault and the Duke's Bridge, taken from the E.
Oblique aerial view of Chatelherault Hunting Lodge, taken from the SE. 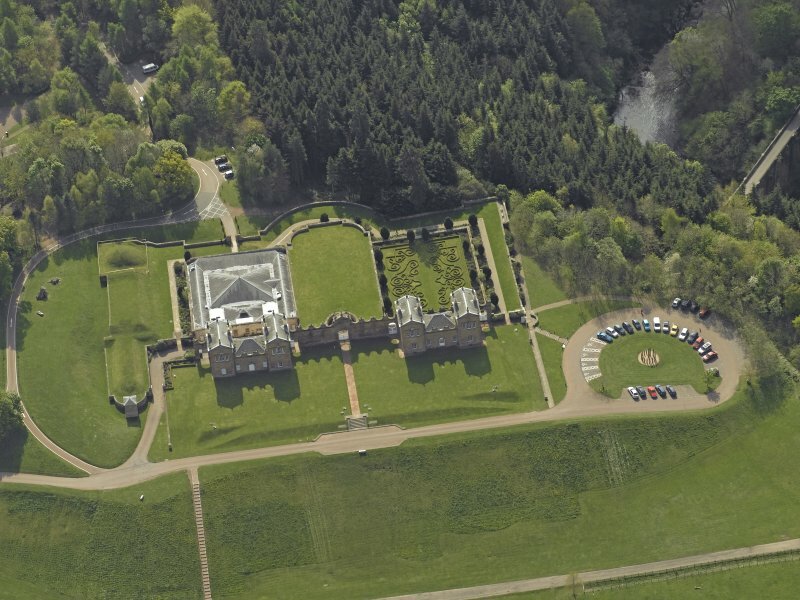 Oblique aerial view of Chatelherault Hunting Lodge, taken from the SSE. 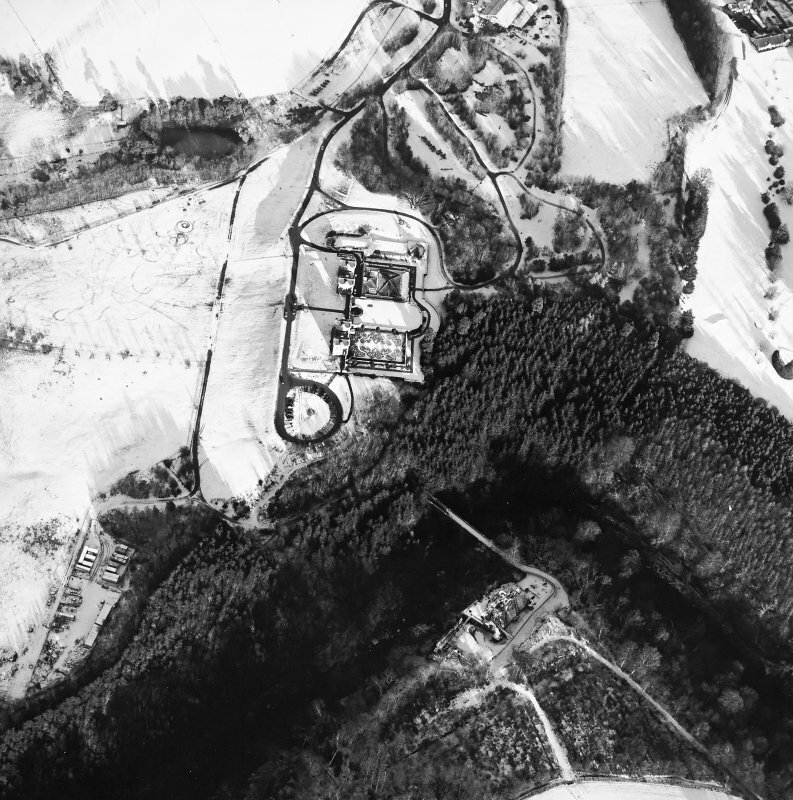 Oblique aerial view centred on Chatelherault, taken from the NW. 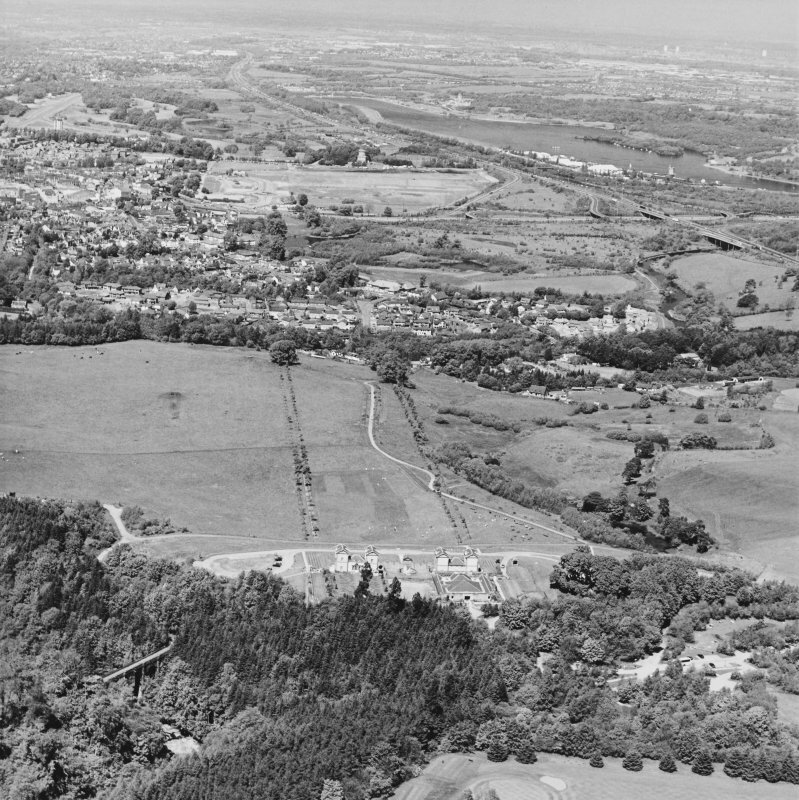 Oblique aerial view centred on Chatelherault, taken from the NNW. 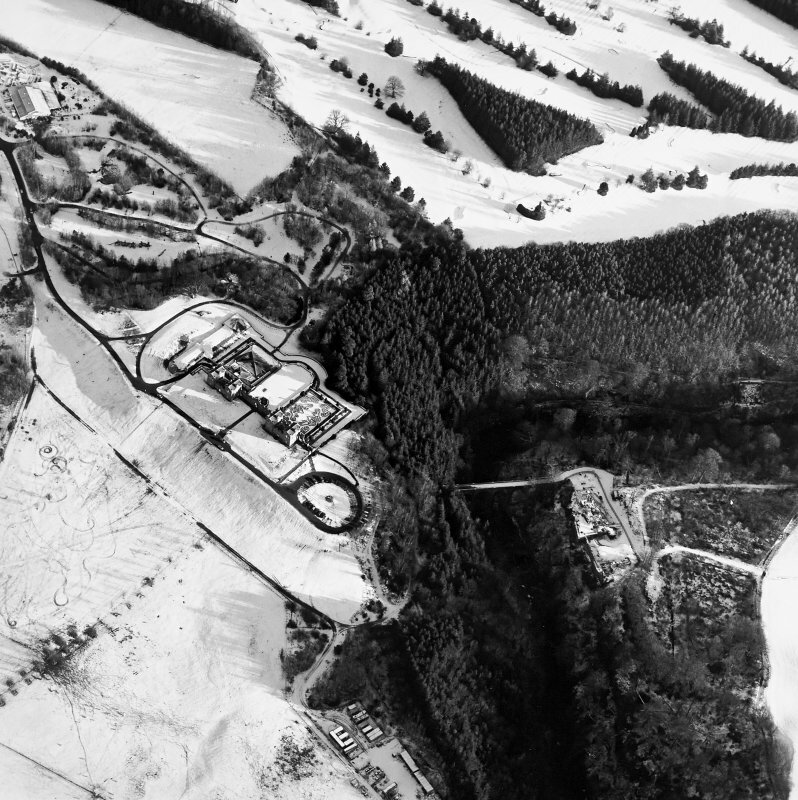 Oblique aerial view of Chatelherault and Cadzow Castle, taken from the NE. 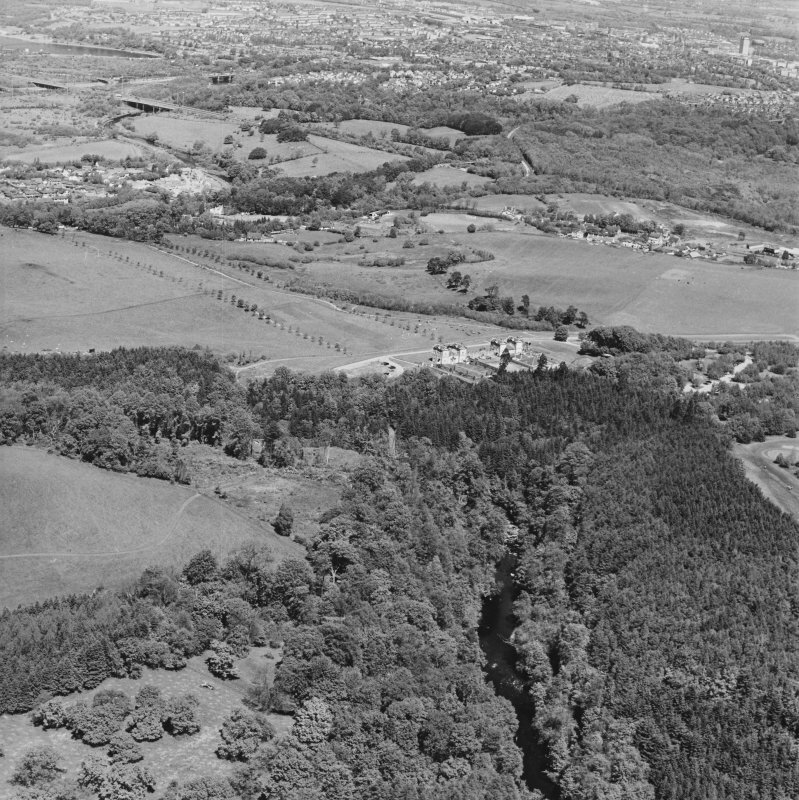 Oblique aerial view of Chatelherault, taken from the NNE. 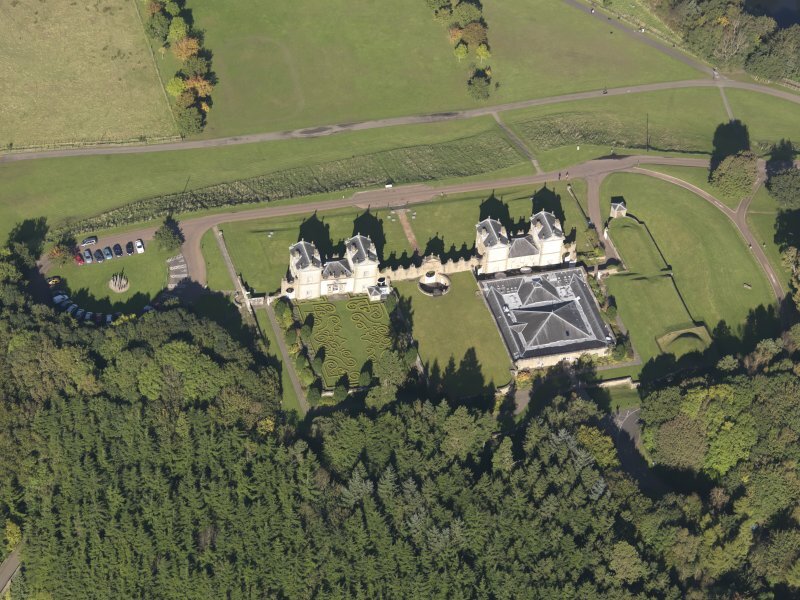 General aerial view of Chatelherault and Hamilton Mausoleum, taken from the SSE. Digital image of C 76871 CN. 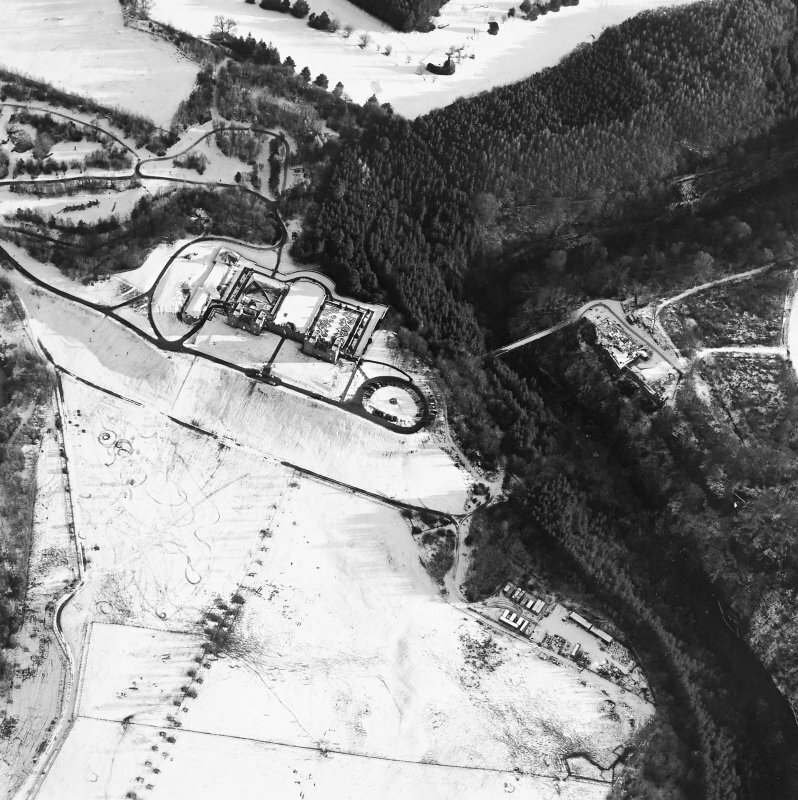 General aerial view of Chatelherault, Cadzow Castle and Hamilton Mausoleum, taken from the SSE. 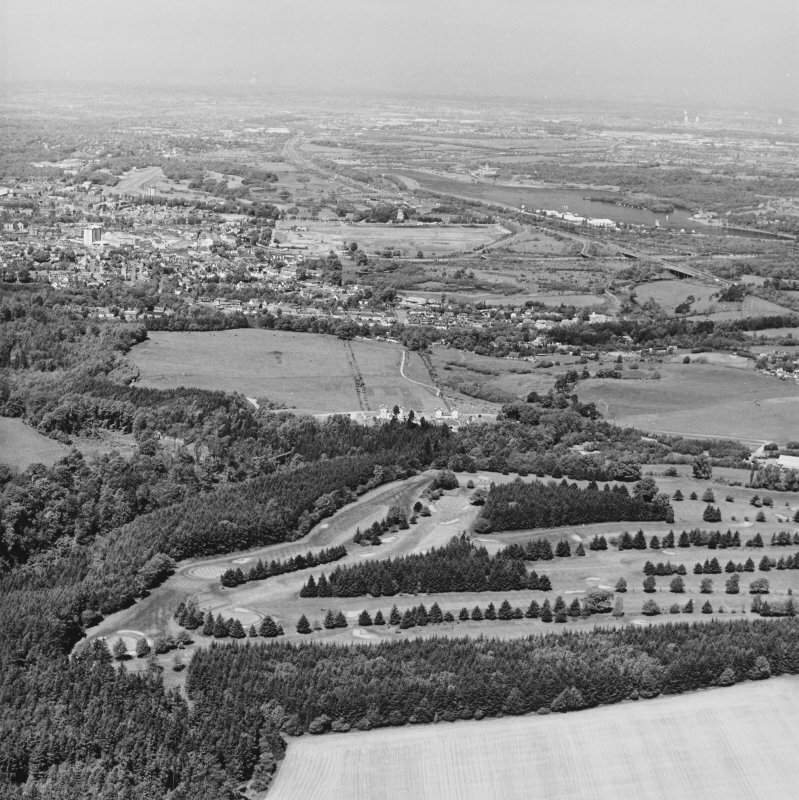 Aerial view of Chatelherault, taken from the SE. 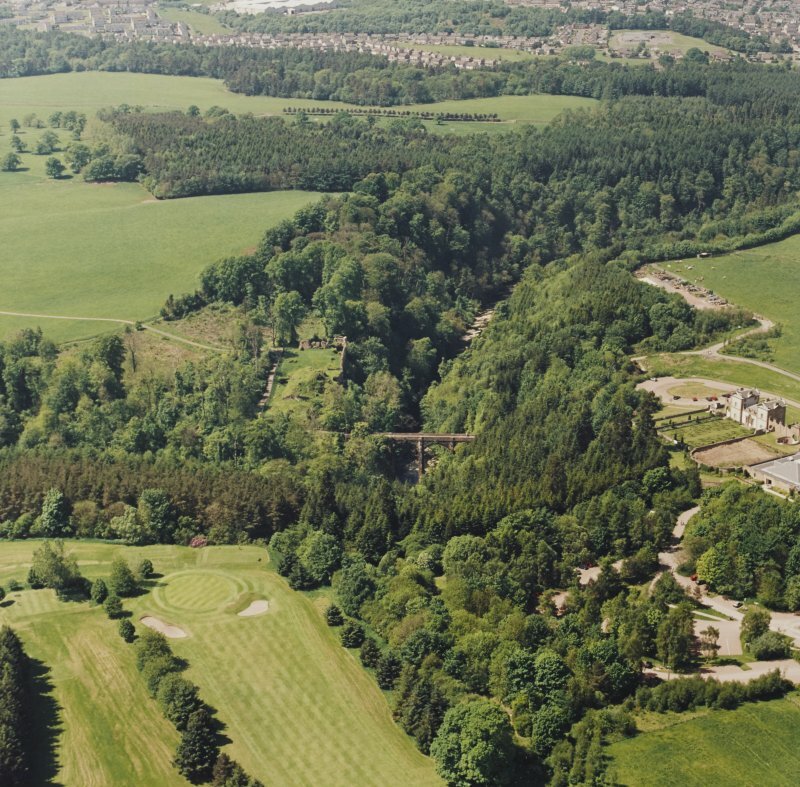 Aerial view of Chatelherault and the Duke's Bridge, taken from the NW. 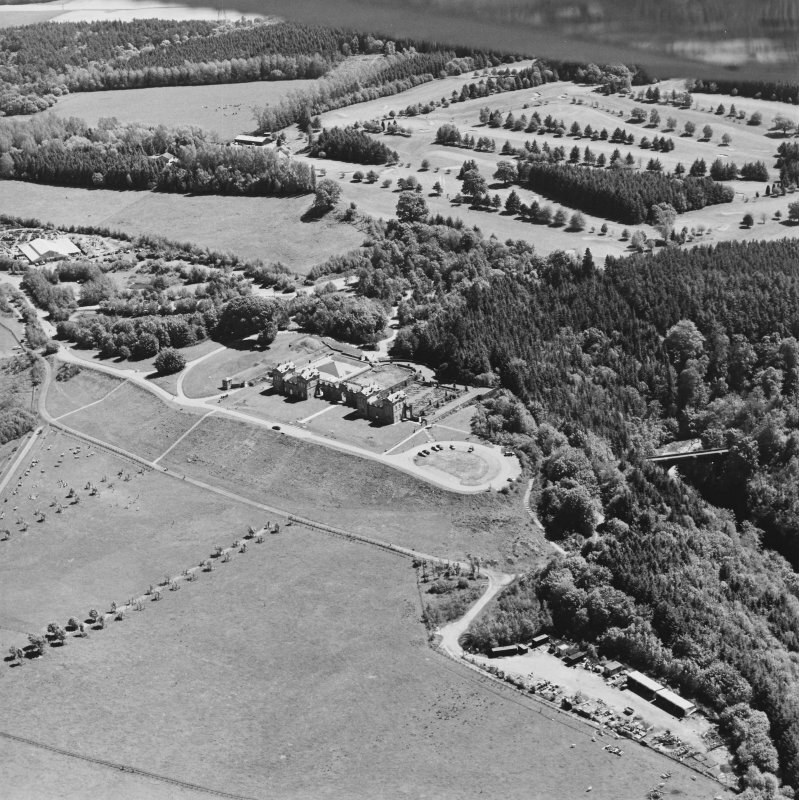 Aerial view of Chatelherault, taken from the NW. 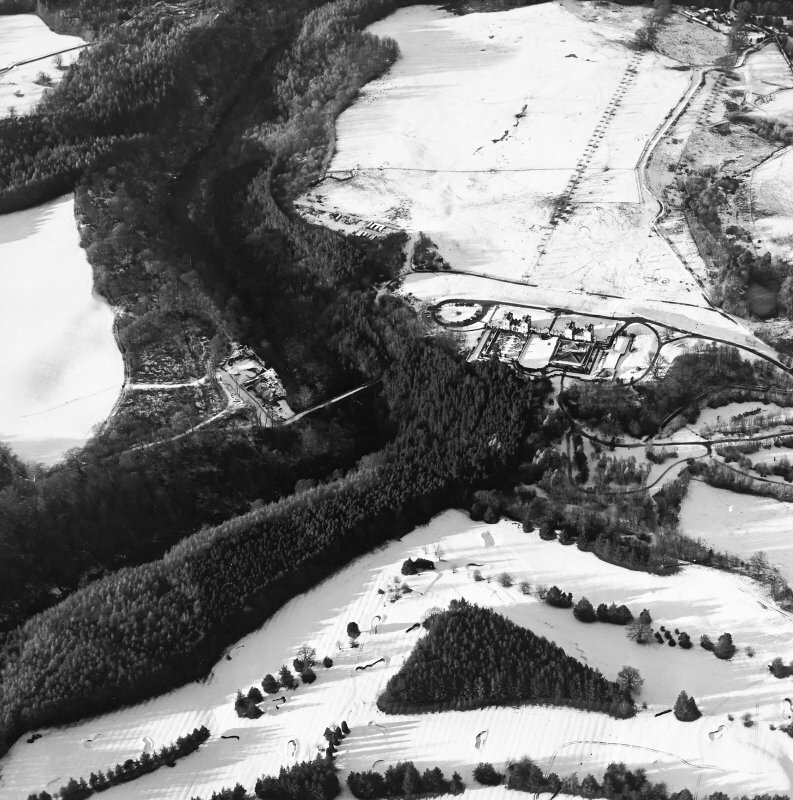 Oblique aerial view centred on Chatelherault, taken from the SE. 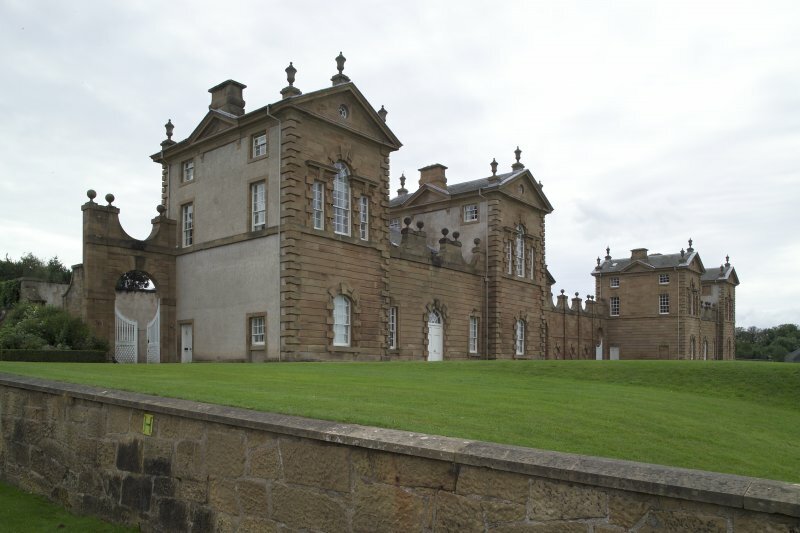 Built as a hunting lodge for James, fifth Duke of Hamilton. 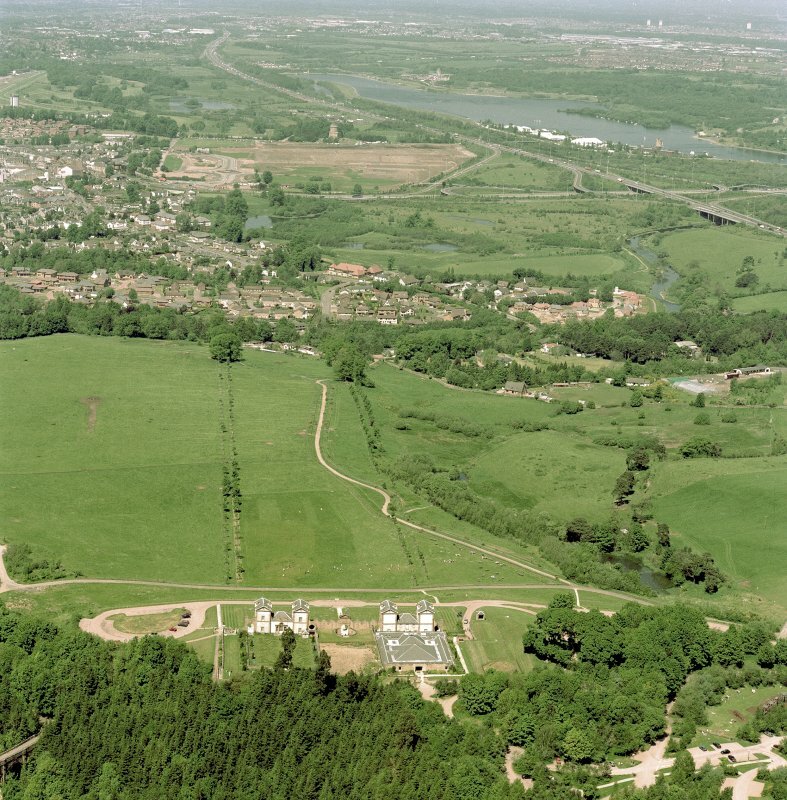 Opened to the public along with part of the High Parks estate in lieu of death duties, 30 September 1987, following ten-year restoration from ruin at total cost of £7m. 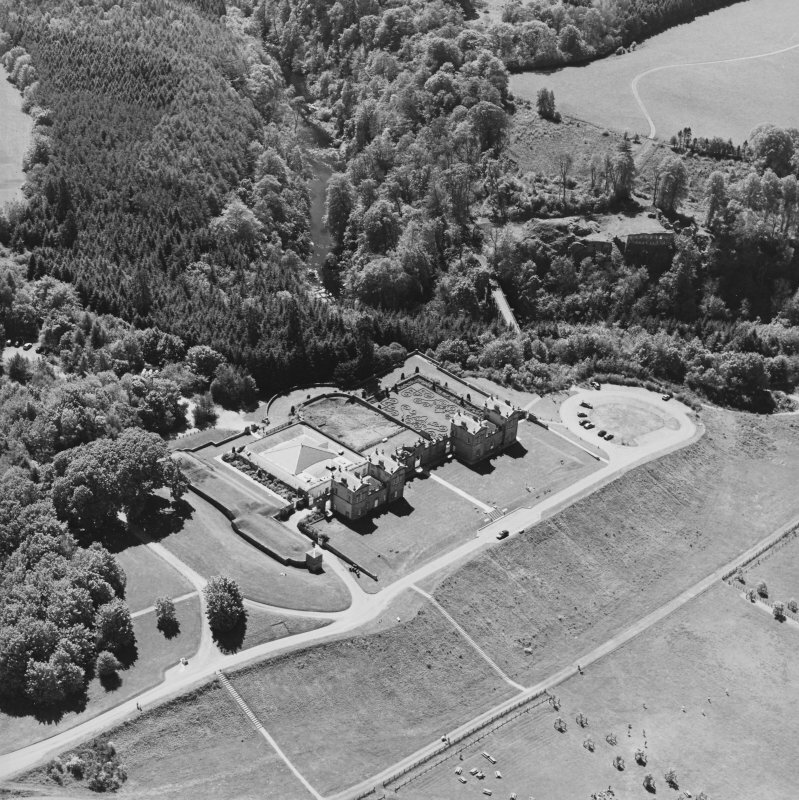 First phase of conversion to visitor centre, involving enclosure of the open kennel courtyard by a pyramid roof, carried out by Brooke Millar Peden 1996. Roof of natural slate, covering prefabricated steel roof trusses and rafters, supported by slim columns. A new main doorway created in S elevation garden wall. 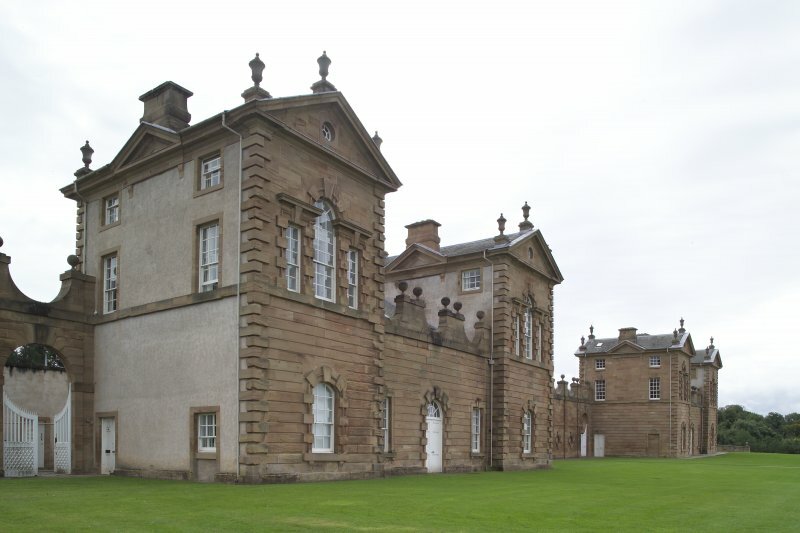 The other house is the keeper's house and kennels which William Adam built for the Duke of Hamilton in Cadzow Park. 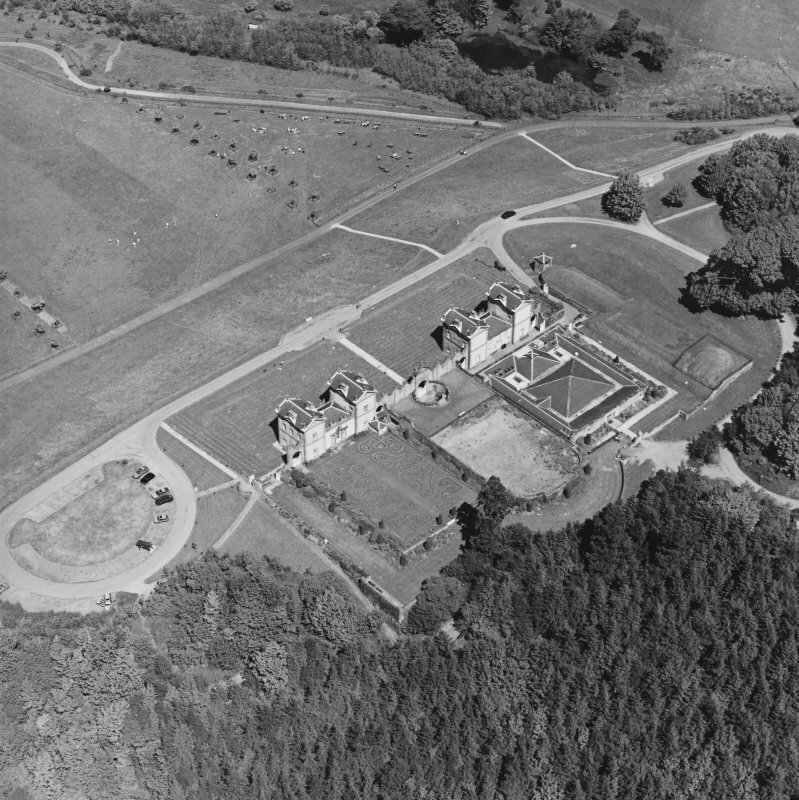 To the keeper's house and kennels he added a large banqueting room very large and lofty with fine plaster decorations and a large panel at the end enclosing a life size portrait horse on which the Duke won some famous race. I suppose this room was intended for luncheon or tea for large shooting parties. 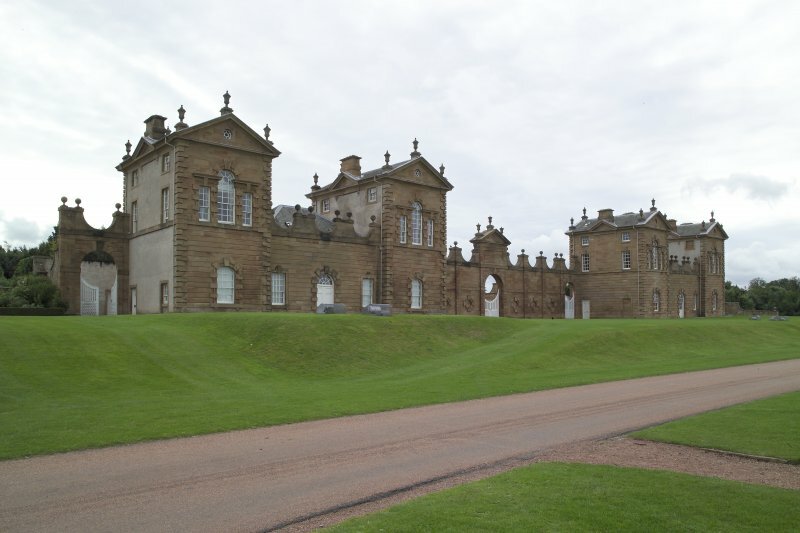 This building is well worth a visit and I should like to take you over to it some day. 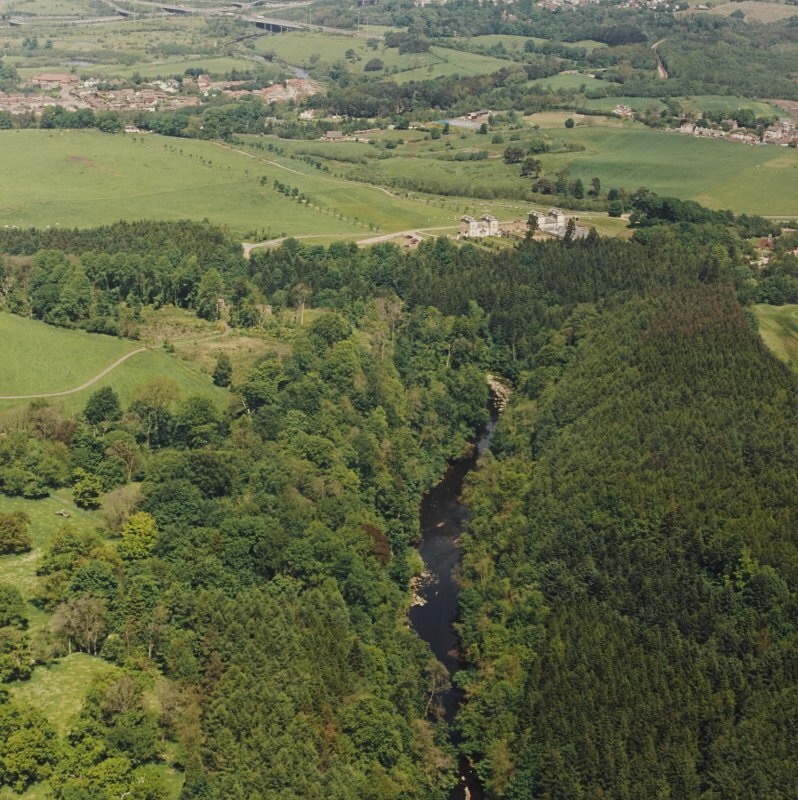 It has a lovely garden and a terrace overlooking the steep and lovely gorge of the Avon. 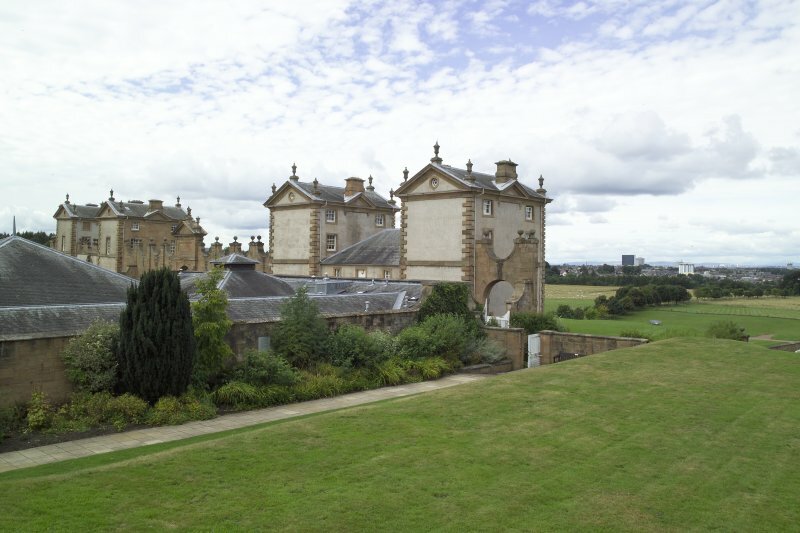 The buildings were designed as a feature on the sky-line as seen from Hamilton Palace from which they were about a mile and a half distant. 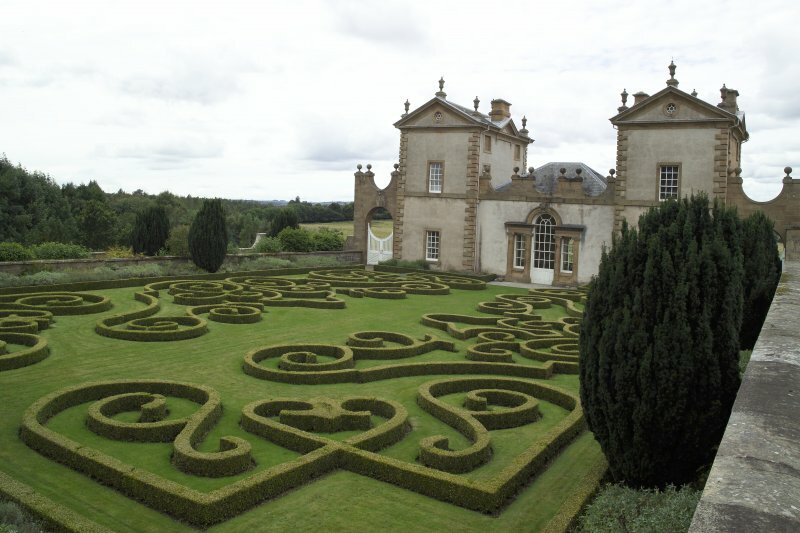 This curious establishment is called Chatelherault from the Duke's french title. It appears in Petruvius Scoticus but without details of the large room. 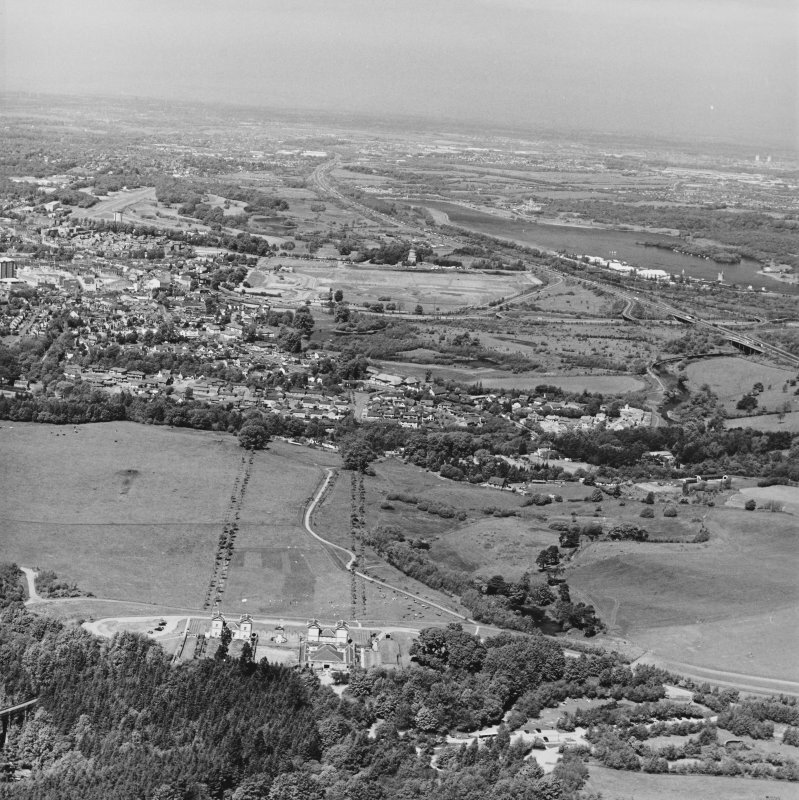 The painting was removed for safety during the war. 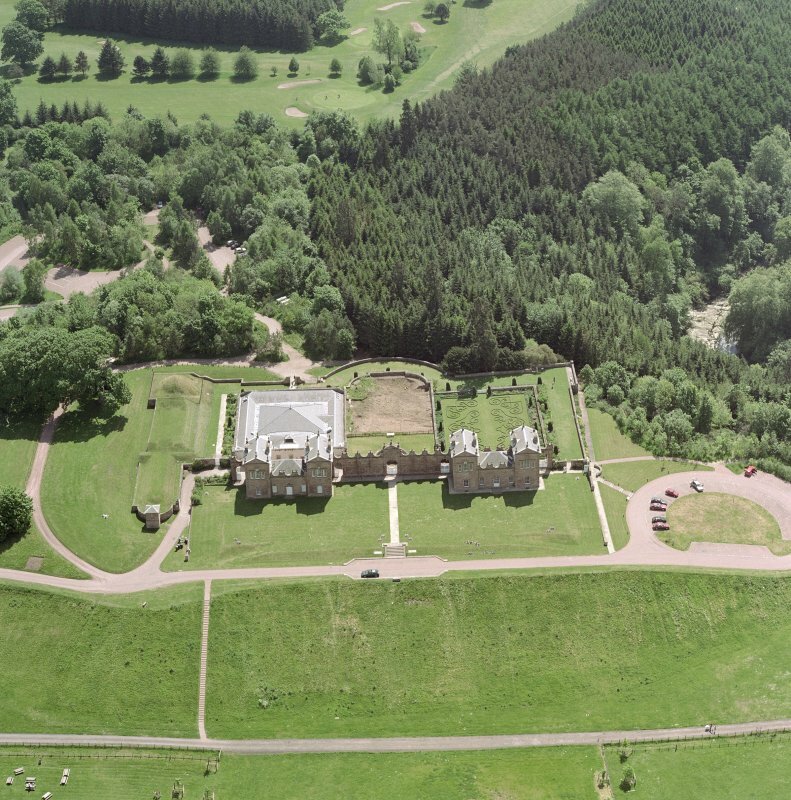 Building of 'the dog kennel' [Chatelherault] Account included in report of claims made by John Adam, Architect, on behalf of himself and his father, William, against the Duke of Hamilton. 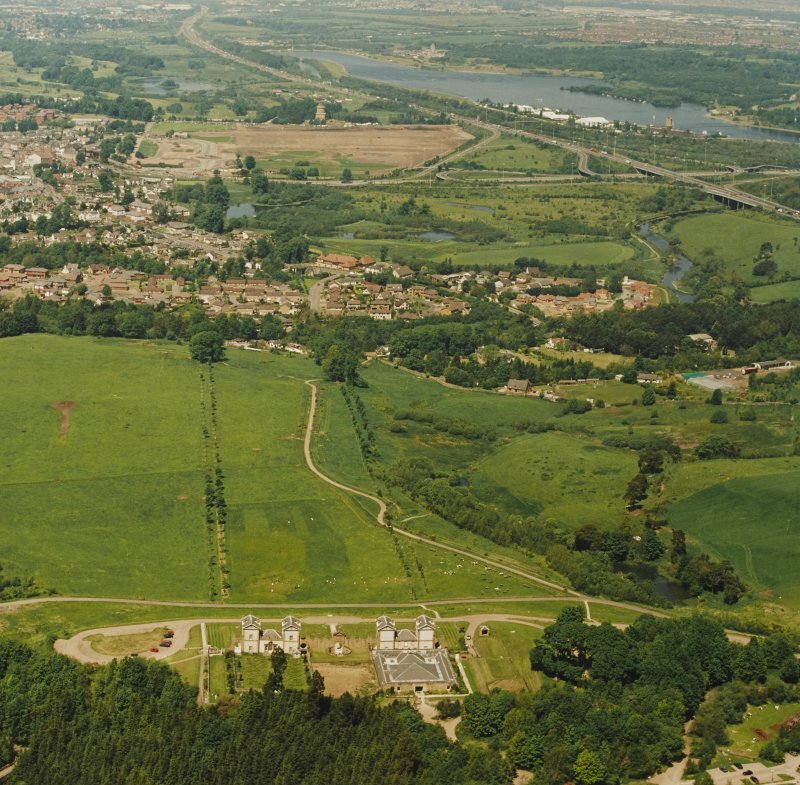 It amounts to #2,392 and covers the years 1731-1743. 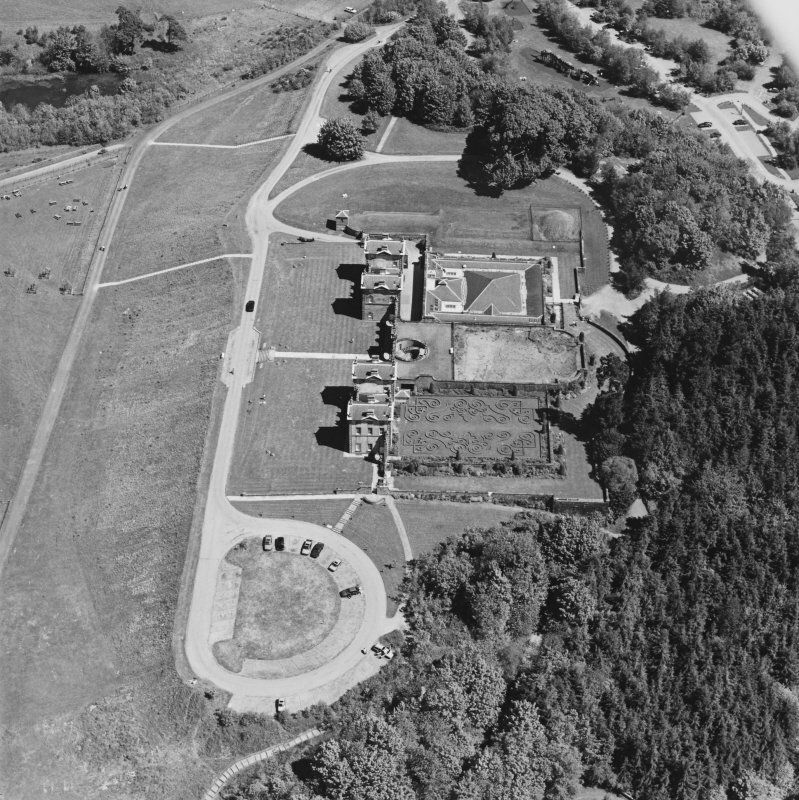 Other accounts indicate that Robert Mein was paid as mason-foreman. 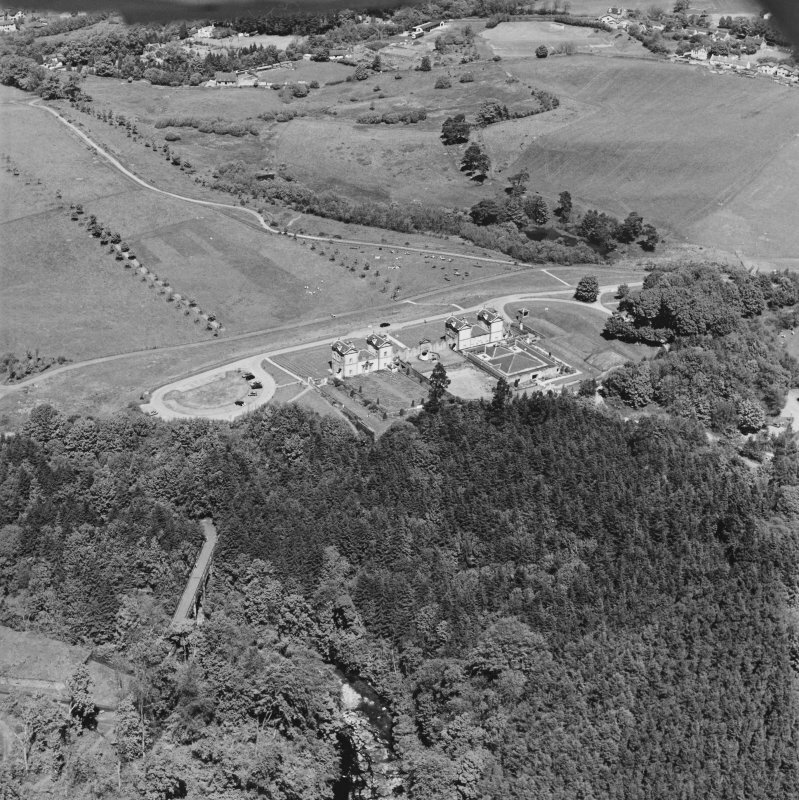 Photographic survey by the Scottish National Buildings Record/Ministry of Works in March 1964. 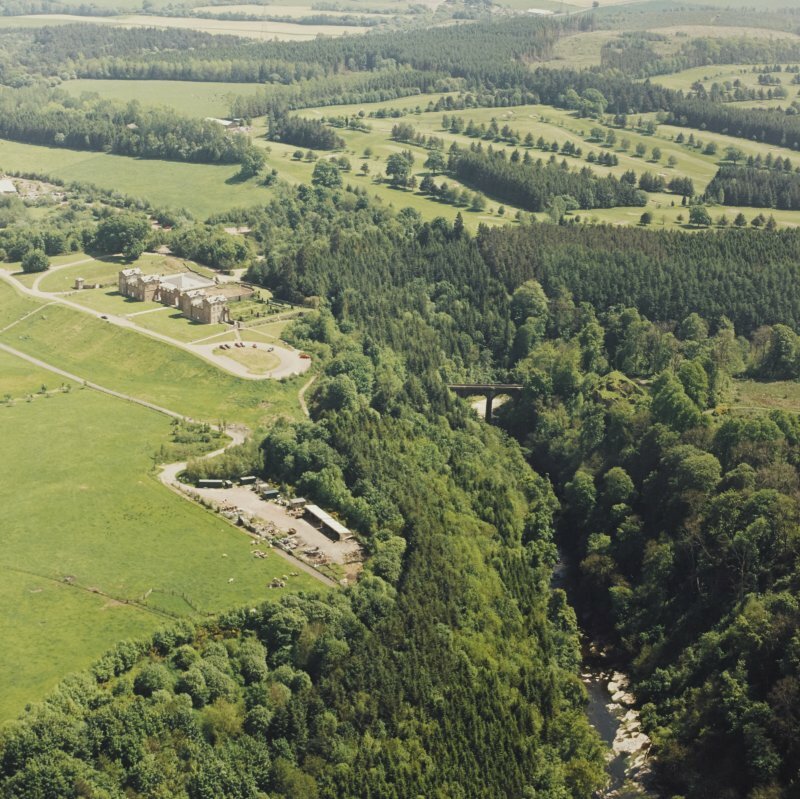 In the early 18th century the principle feature of the Hamilton Palace policies was the mile long avenue leading from the palace to the ravine of the River Avon with the ruins of Cadzow Castle beyond. 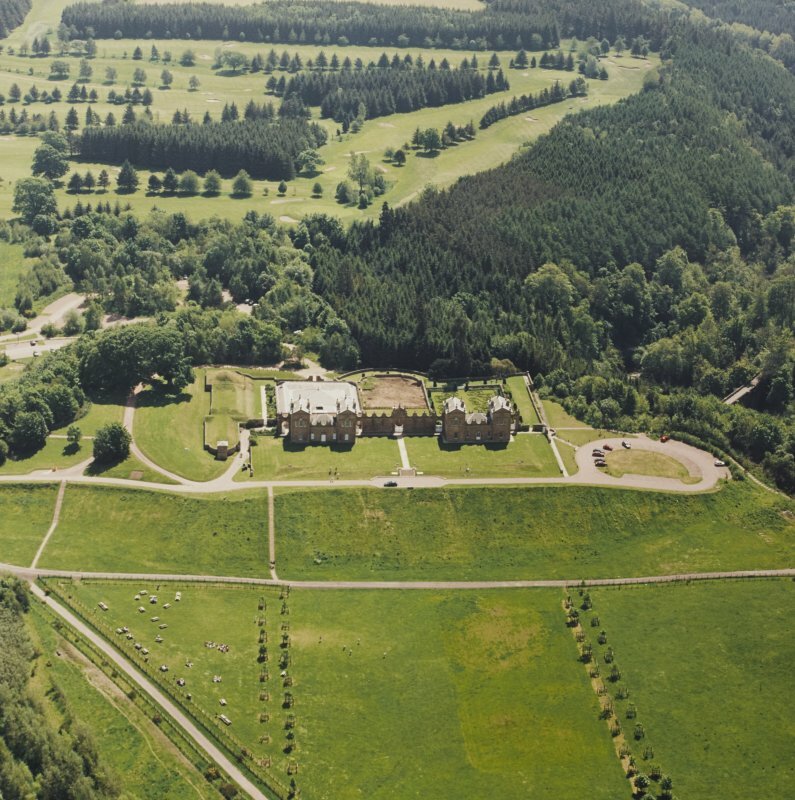 William Adam was commissioned by the 5th Duke of Hamilton to build an eyecatcher to terminate the vista. 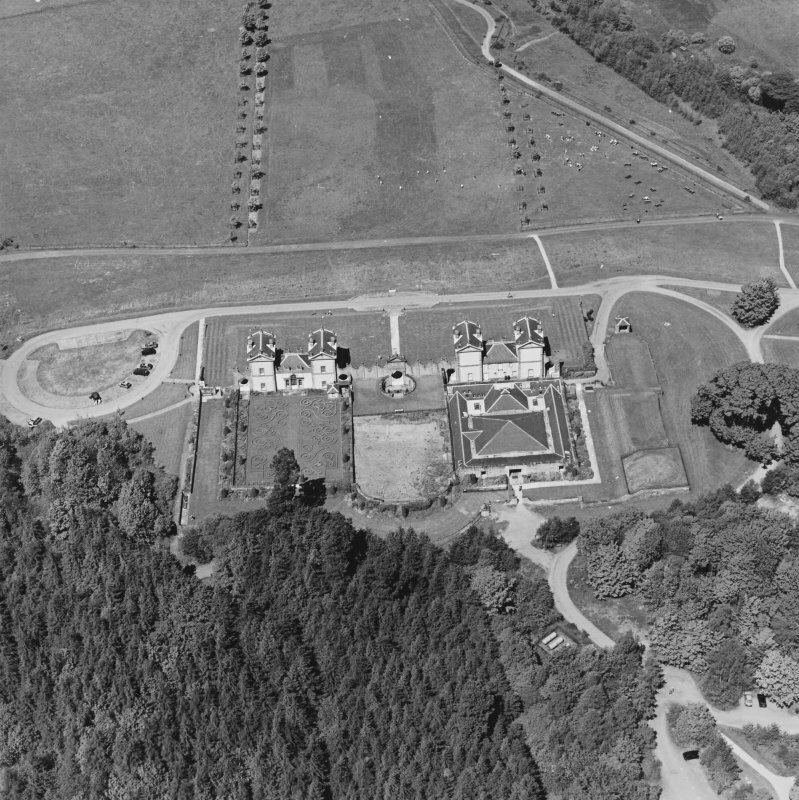 The resulting building combined both the practical 'Dogg Kennell’ with the more frivolous ‘Banqueting House’; its Palladian style is handled with a baroque bravura. 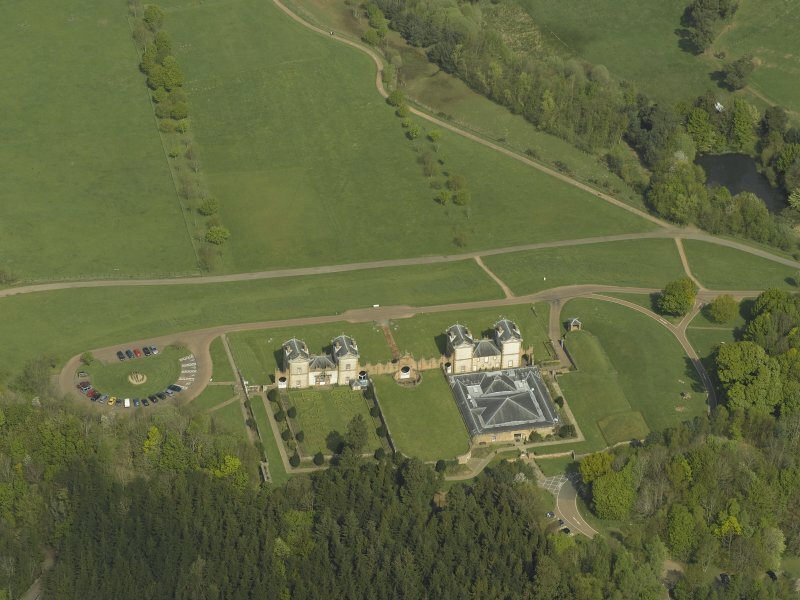 Adam’s design appears to be inspired by a variety of interesting contemporary fashionable buildings including Queen’s College, Oxford and the great country houses of Wilton and Houghton. 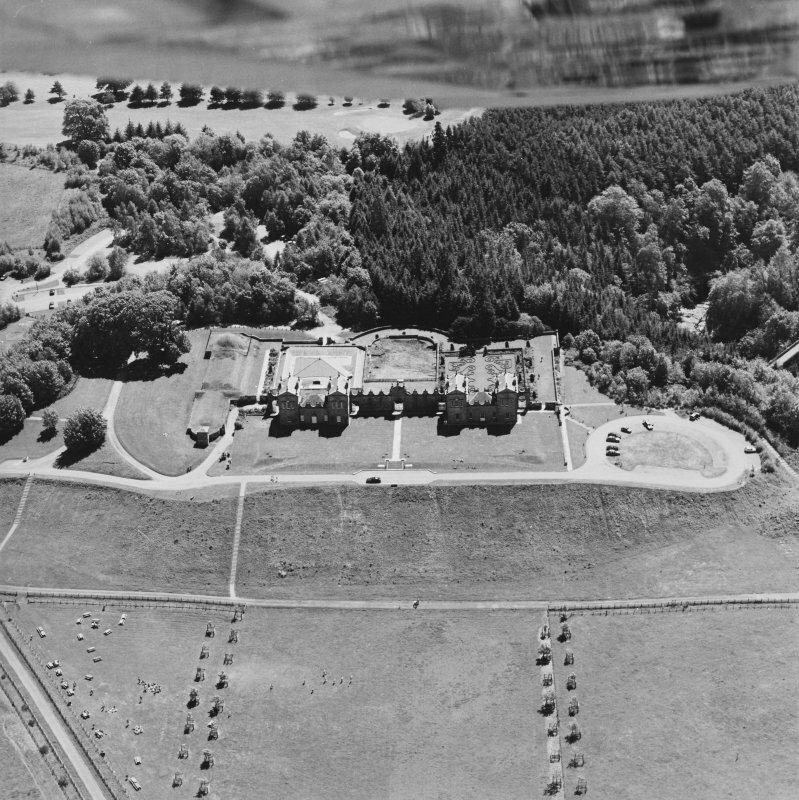 He adapted the plan form of a French Hotel to his unique requirements. 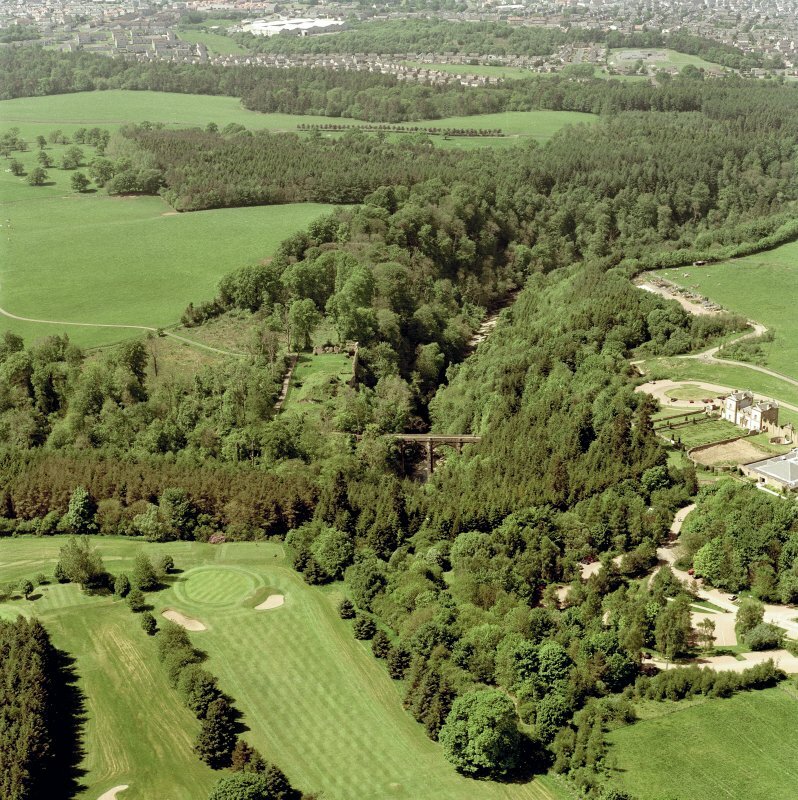 The name recalls the French dukedom given to the Earl of Arran, the Duke's ancestor, by Henri II in 1549. 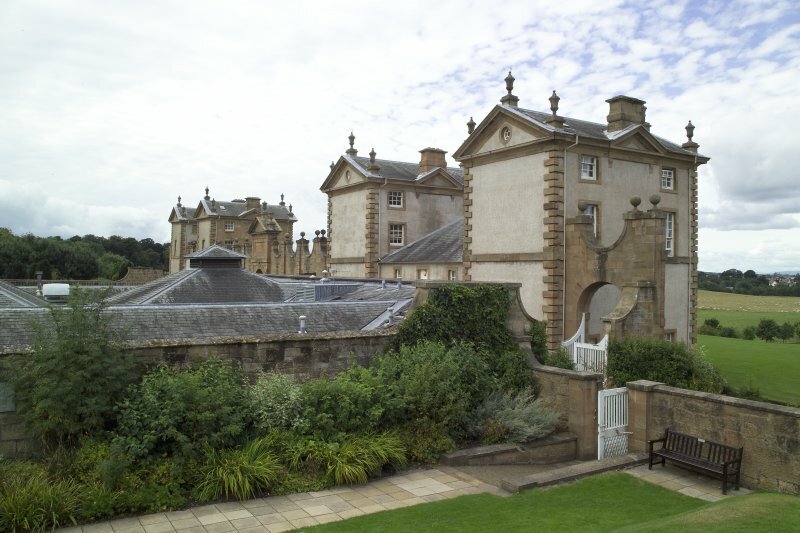 Work was begun in 1731, but Thomas Clayton did not complete the plasterwork of the banqueting house until 1742. 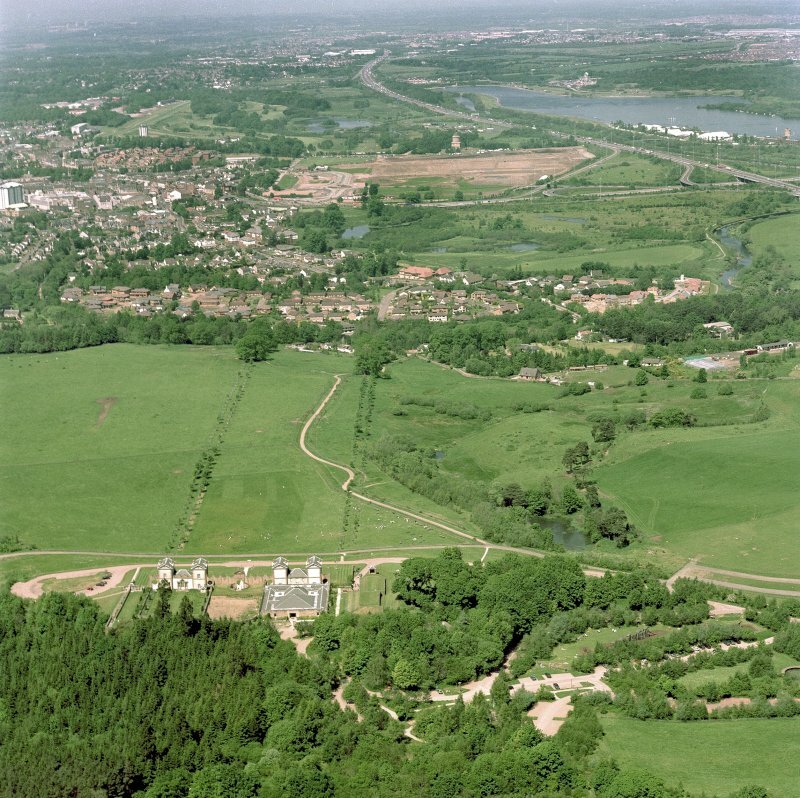 It was opened to the public, along with a part of the High Parks estate, on 30 September 1987, following a ten-year restoration from ruin at total cost of £7m, having been accepted by the government in lieu of death duties. 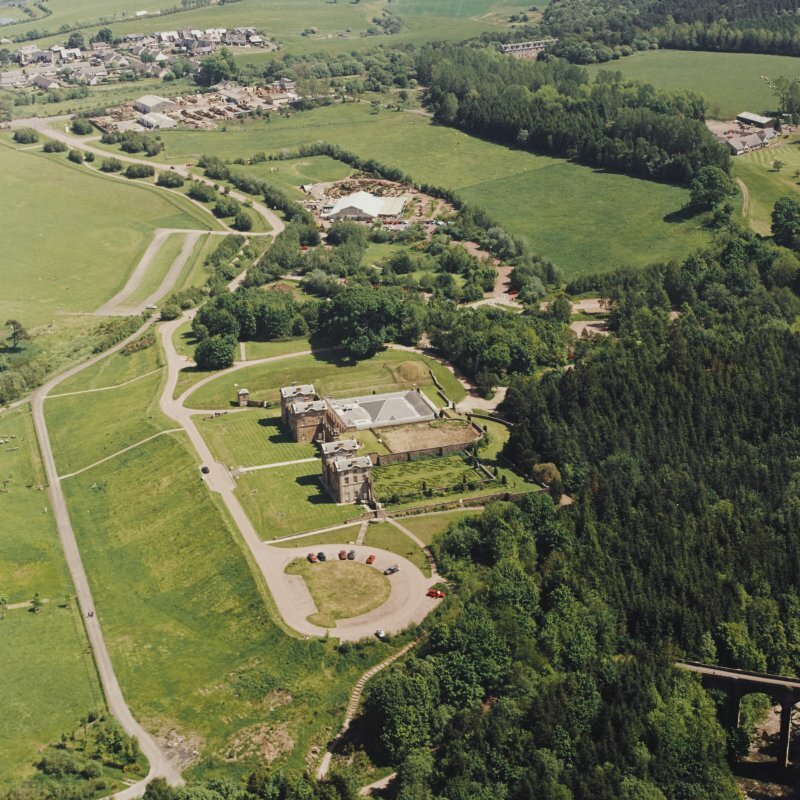 The first phase of conversion to a visitor centre involved the enclosure of the open kennel courtyard by a pyramid roof, carried out by Brooke Millar Peden in 1996. 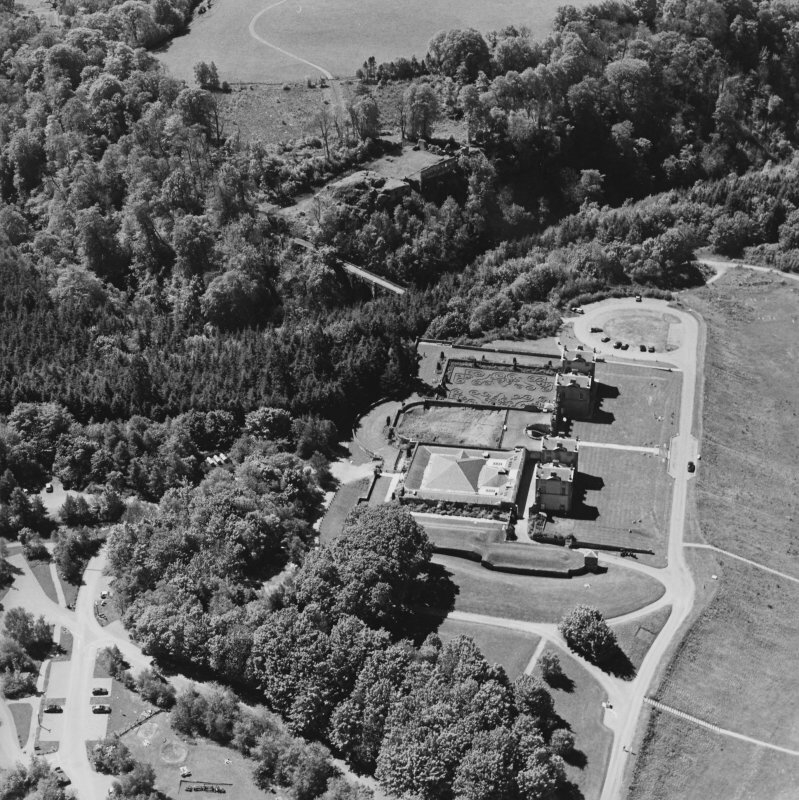 The roof is of natural slate, covering prefabricated steel roof trusses and rafters, and supported by slim columns. 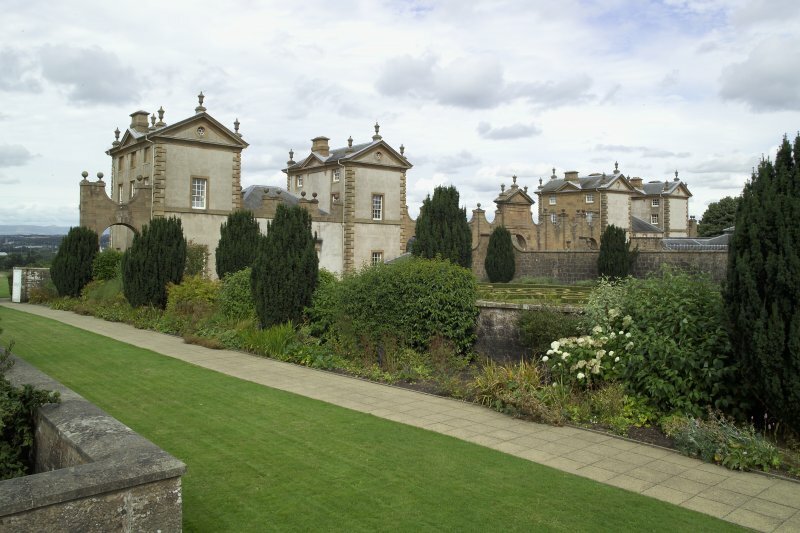 A new main doorway was created in the south elevation garden wall.